We have had so much fun exploring apples this fall! It has been a great way to introduce the changing of the seasons, do some cooking and baking and delve into some school related activities. We have done lots and lots of cooking and baking this week! We made applesauce in the crockpot. Everyone got a turn to peel the apple and they loved it! Once everyone had a turn we put our peeled apples into the crockpot with Apple Cider and let them cook down for a few hours. After our applesauce had baked for a few hours, we took turns having a taste test! It was about 50/50 response for the children that loved it or thought it was ok.
Then we made mini apple pies with the children. This was their favorite baking activity! Again we got to use the big peeler to peel the apples. Once we added some cinnamon and sugar to our apples we cut out circles from pre-made pie crust. They baked into small mini apple pies in the muffin tray. It was the perfect size for a taste test! I’m not sure what they liked better…the apple pies or the ice cream?!! We have also read “Ten Apples up on Top” a few mornings in a row. The children loved to stop the book, count the apples, and see which character was in the lead. I extended this concept by putting up an apple activity on the magnetic board. Each of the characters are on magnets, and then I put lots and lots of apples on the board. We would stack them up high and try to count how many apples were on top! You can see B below put almost all of the apples on the dog! It has been a very busy week of baking and eating! I can’t wait see what adventures we can have next week! Categories: early childhood education, Uncategorized | Tags: apples, book and cook, cooking with kids, fall, fall sensory bins, fall themes, play dough | Permalink. We worked hard throughout April to create our last few animal murals. We spent a week discussing the ocean and all of the amazing animals that live in the ocean! The picture below shows A coloring a tin foil fish with sharpies. 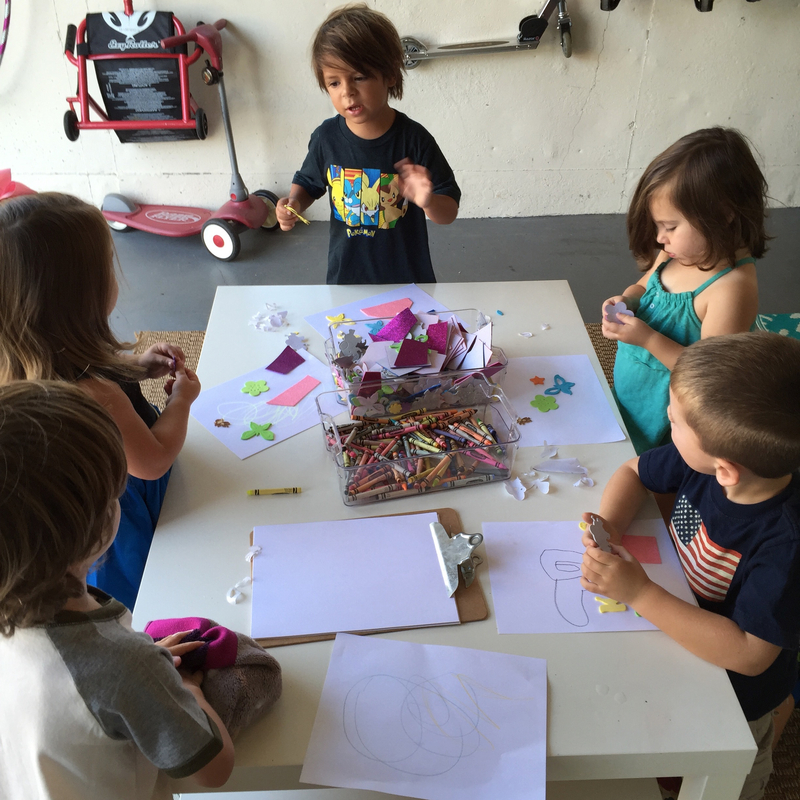 After they colored their fish, we squeezed out glitter glue on top of the foil to give the fish their scales. 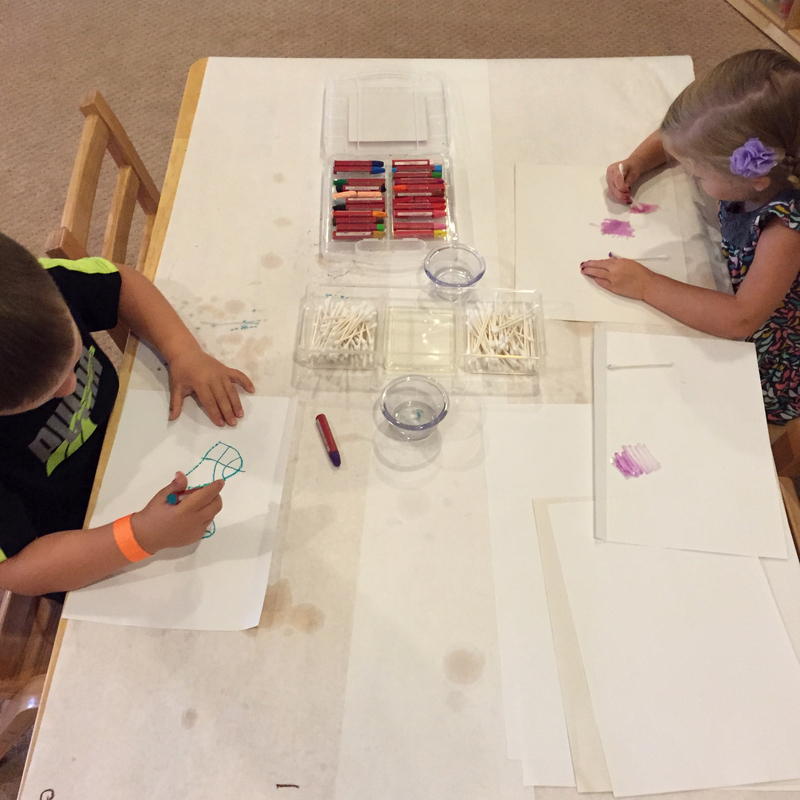 A and C are using our watercolors to paint their jelly fish. Once their jelly fished dried, they got to cut the long tentacles on the bags. We also worked on our Desert Mural too! 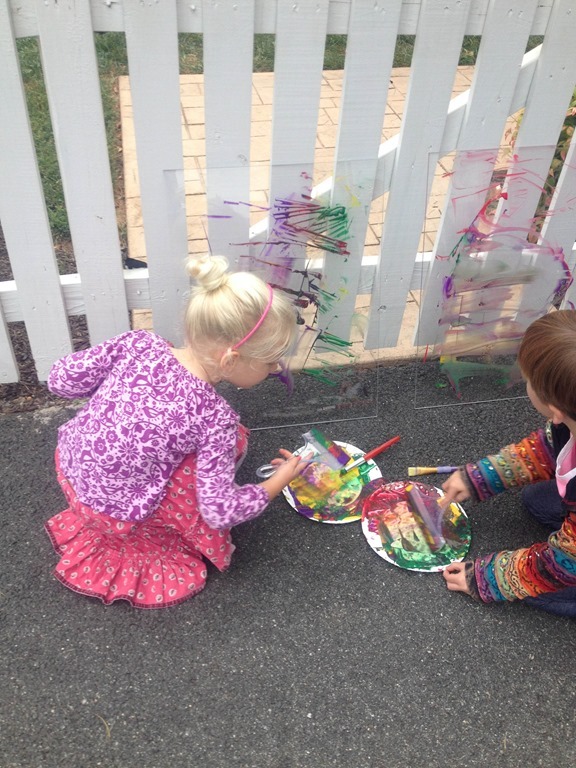 We made cacti by painting large green strokes with the paint rollers, and then adding lots of prickly spikes! Below is a close-up of our shape lizards. The children glued shapes onto their lizards and then dropped silver paint on top to give them shiny skin. The last part of our animal project was creating our special animal with clay. Each child got to pick an animal to represent with clay. I printed out a real-life photo of the animal for each child to look at while they were making their project. Once the clay dried many children decided to paint their clay pieces too. 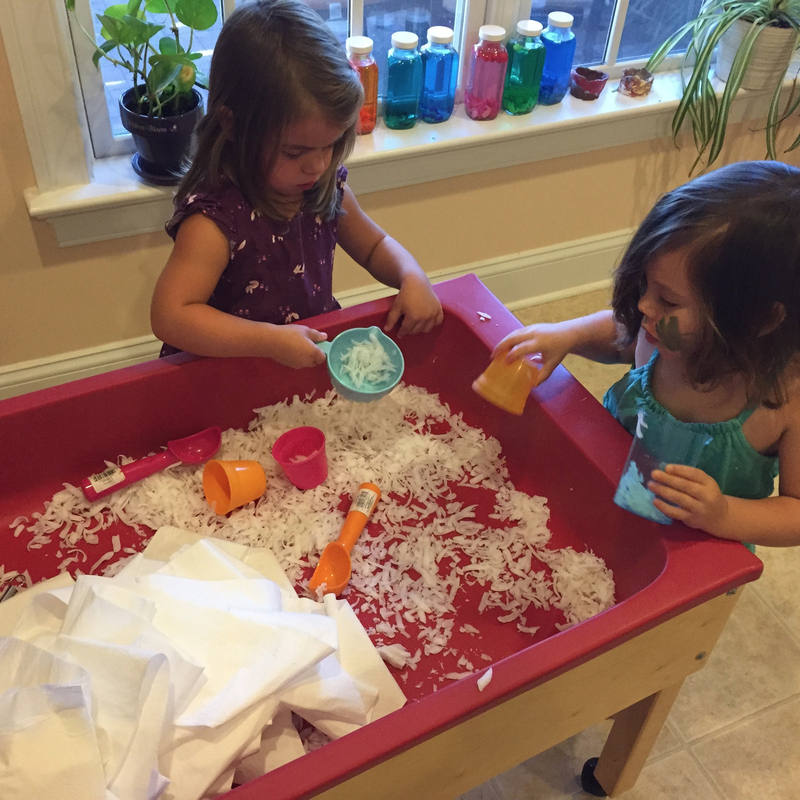 While we were discussing the ocean I set up a large ocean sensory tub. I filled the tub with water and lots of different colored water beads. Then I added large ocean animals, and they went to town! 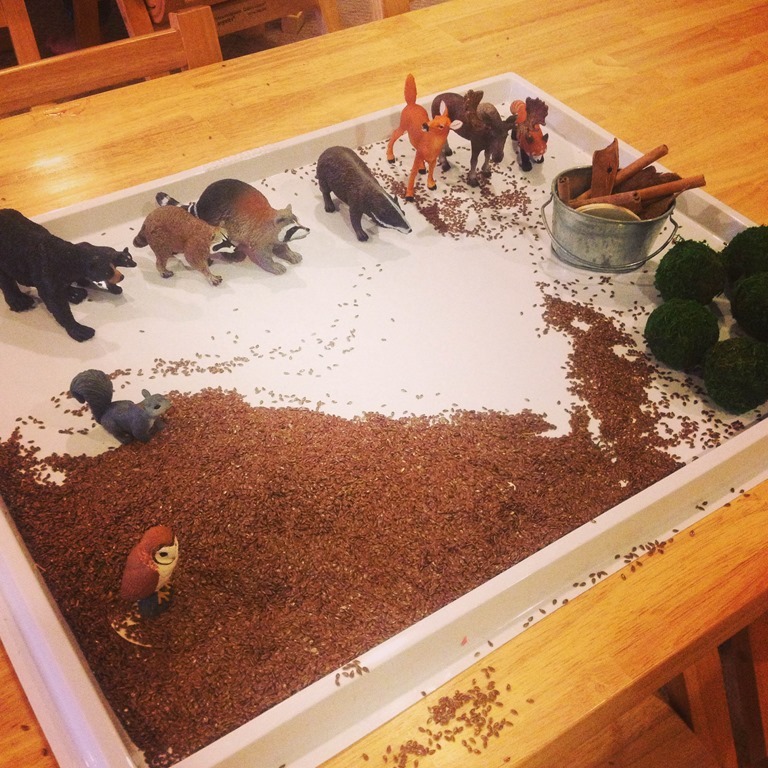 The children have also still been very busy building animal homes and habitats around the classroom! 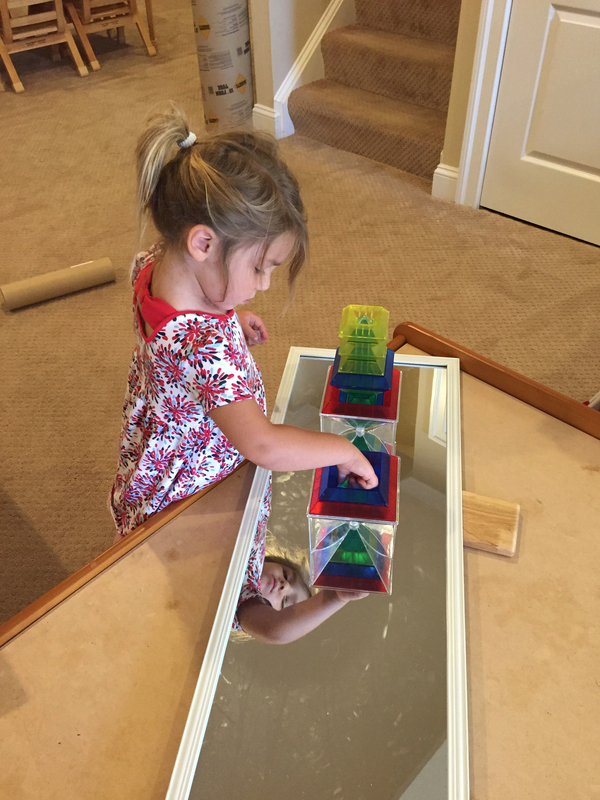 They love to use the Magnatiles to make divided homes for the animals. 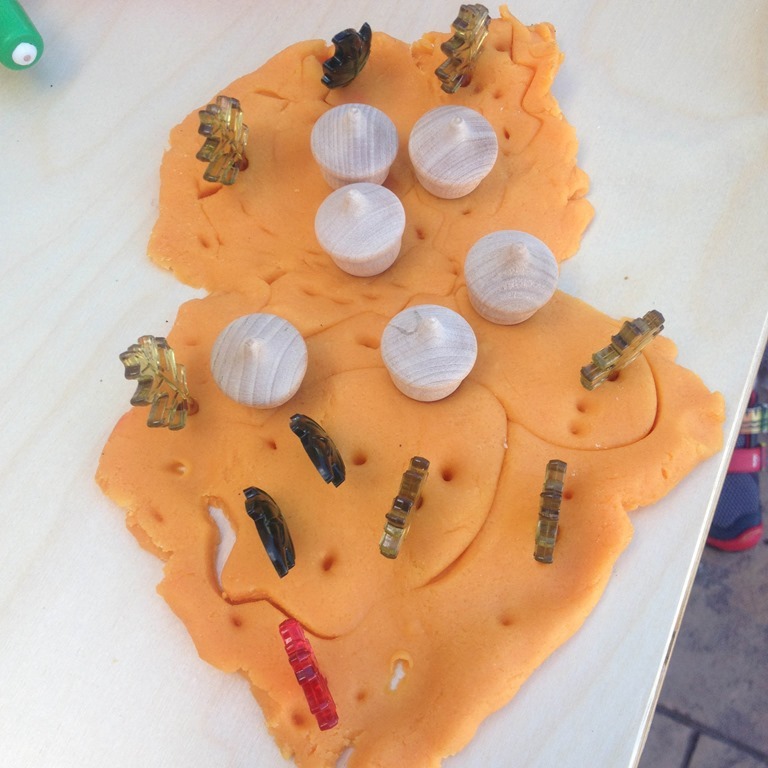 The home area below using Magnatiles, connecting blocks, birds, elephants, and a stuffed animal brought from home! 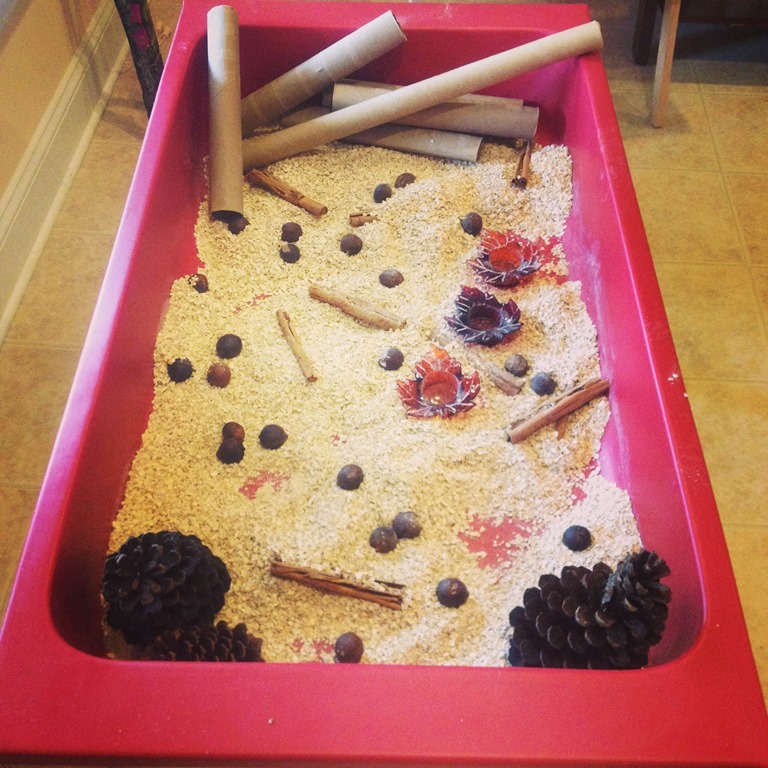 Another sensory tub I created for the end of April was a giant construction site. 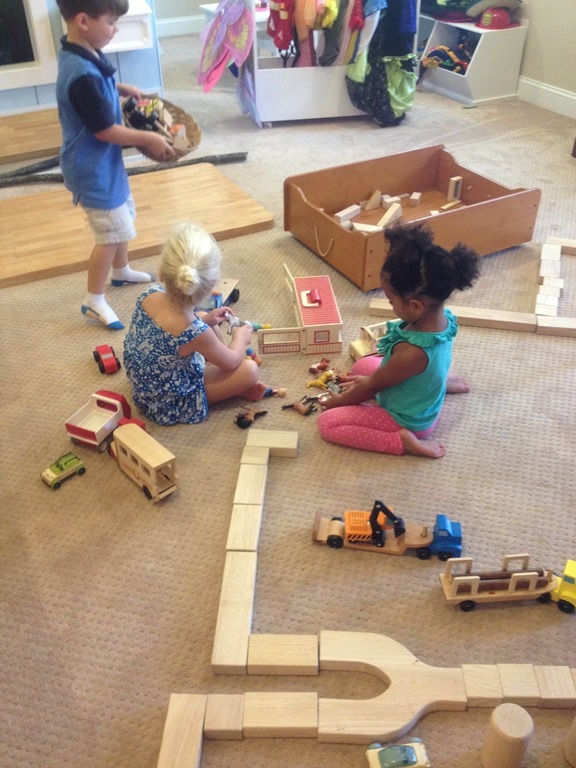 The children love to play with the trucks, and play mobile people. I combined both of these with a huge tub of pinto beans! In celebration of spring we put out a large tray with kinetic sand, spring cookie cutters, and lots of colorful gems. 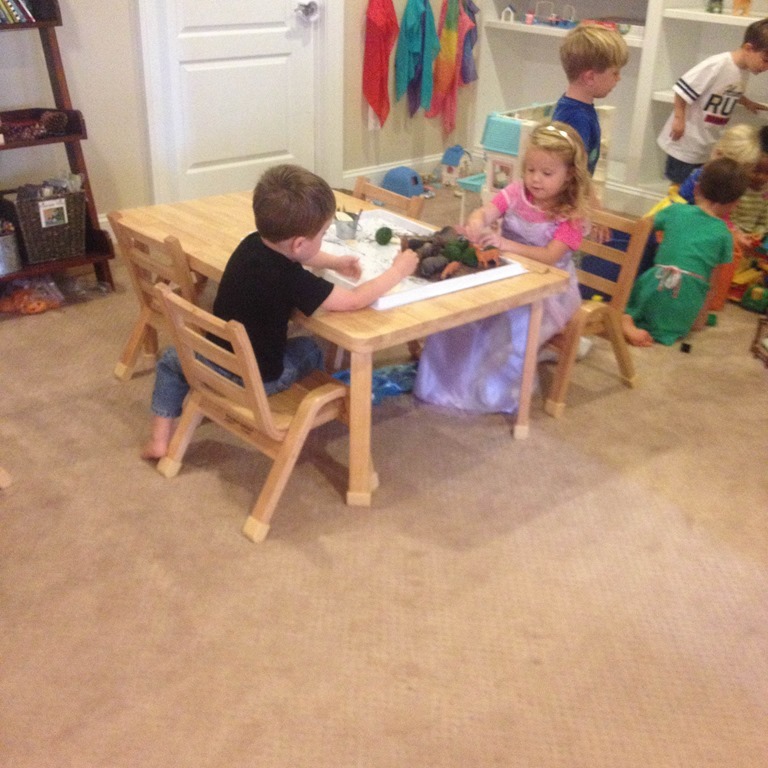 We have continued to follow along with two to three Handwriting Without Tears lessons a week. We have now covered all of the letters that only have straight lines and diagonal lines. We only have curved letters left, and we will have worked through the entire alphabet! In addition to the handwriting lessons, we have started discussing the phonetic sounds that each letter makes. I pulled out my phonetic buckets to accompany our lessons. Each bucket has small charms or tiny toys that represent each letter sound. Then I laminated these Constant-Vowel-Constant grids. 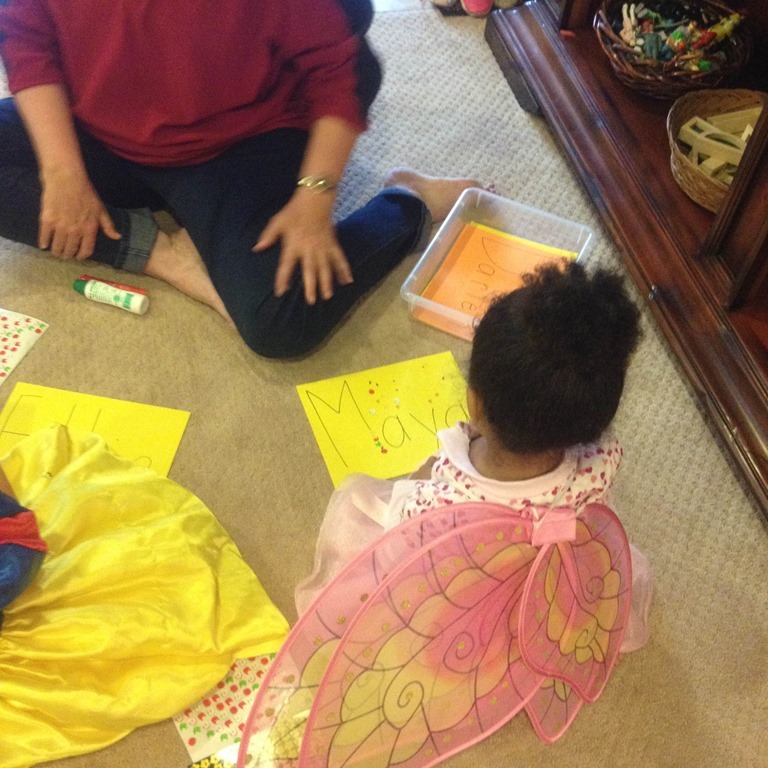 Children got to come over to work in small groups to sound out these simple C-V-C words. 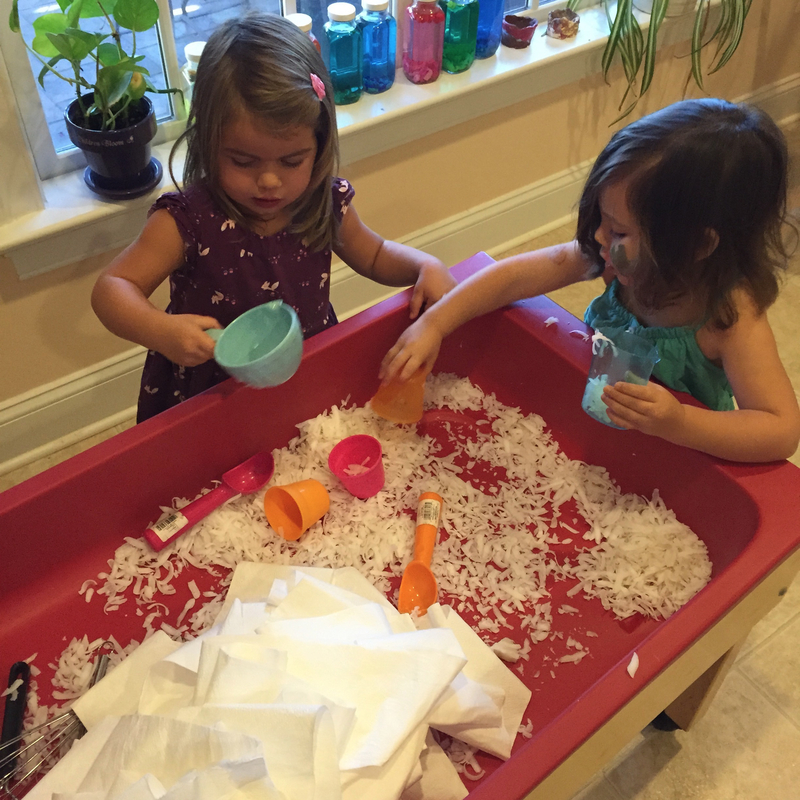 They had a great time with this new task! I drew different lines and designs on large pieces of paper. Then I collected different stones to place along the lines or around the spiral. 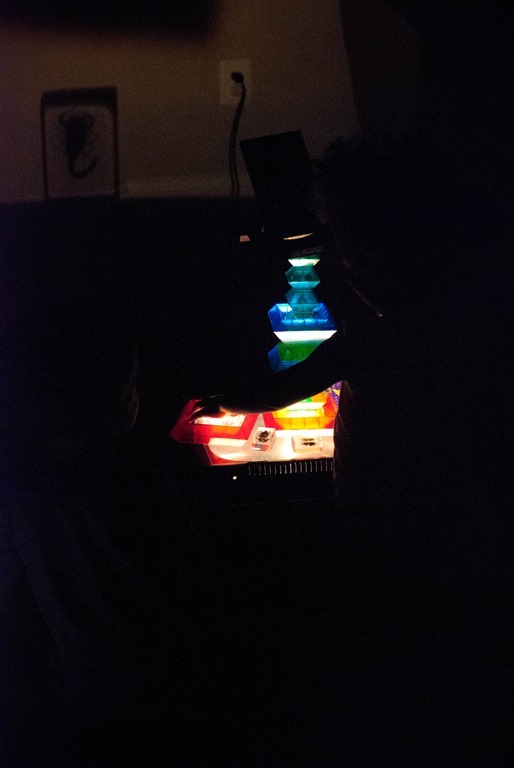 Each of the children got a chance to work at the light table, and they all had different versions on how to line up the pieces. Then I put stirring sticks and gem ice cubes on the light table. They really came up with some creative designs. I can’t wait to see what adventures await the last month of school! 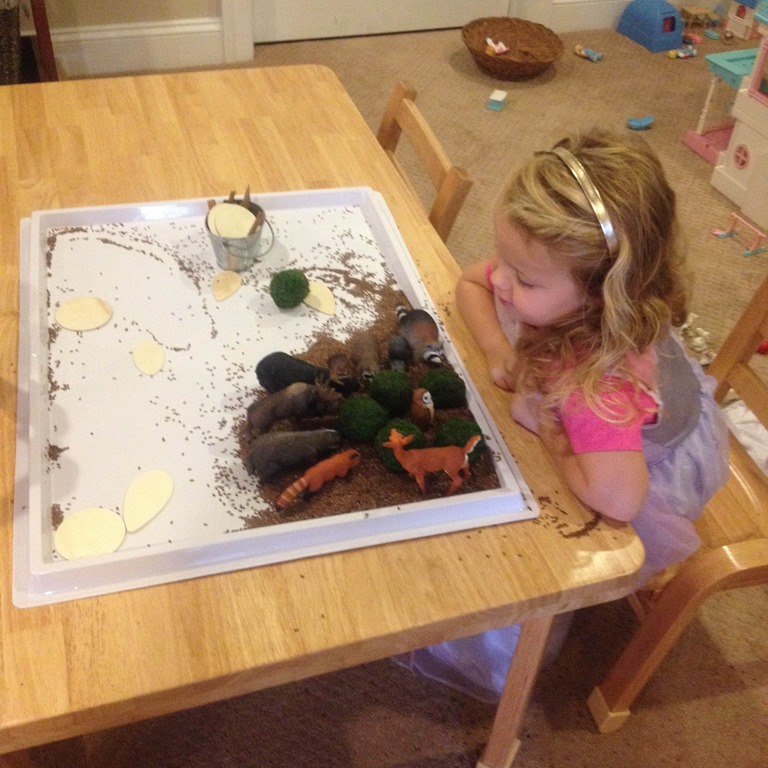 Categories: process art, reggio emilia inspired | Tags: animal study, animal unit, animals, cha, clay, collaborative art, learnning through play, light and shadow, light and shadow project, light table, mural, play based preschool, play dough, preschool science, process art, reggio inspired, sensory play, sensory tables | Permalink. Gak, Clean Mud, and Much More! 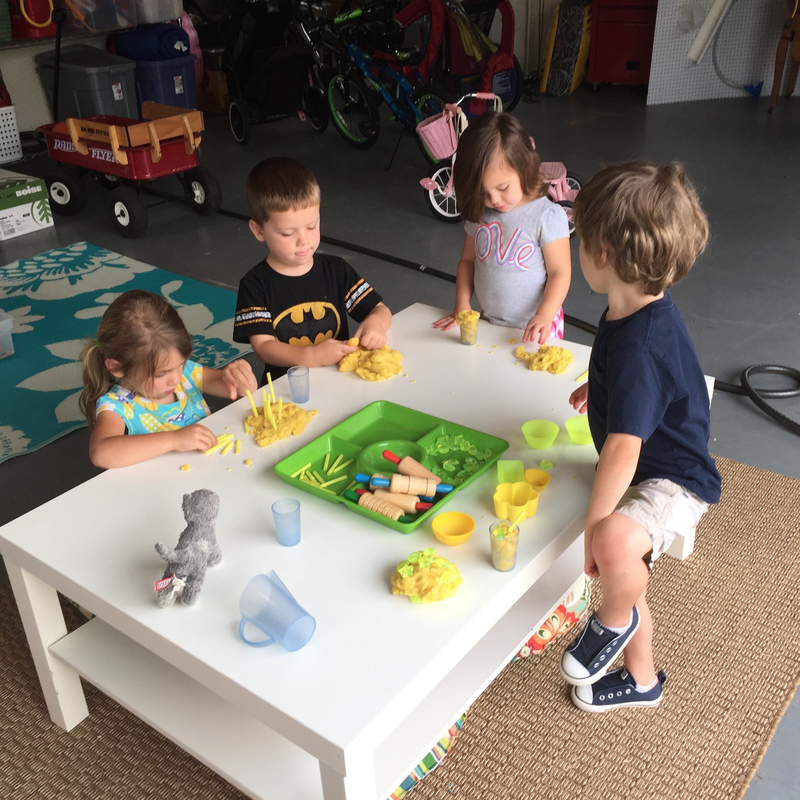 We have been introduced to so many new play experiences this first month of school! I apologize, but this will be a long post full of photos. I have been trying to focus on one exploration at a time in my past blog posts, but I wanted to use one post to quickly catch you up on all of our happenings! We have been adding new materials to our classroom each week. 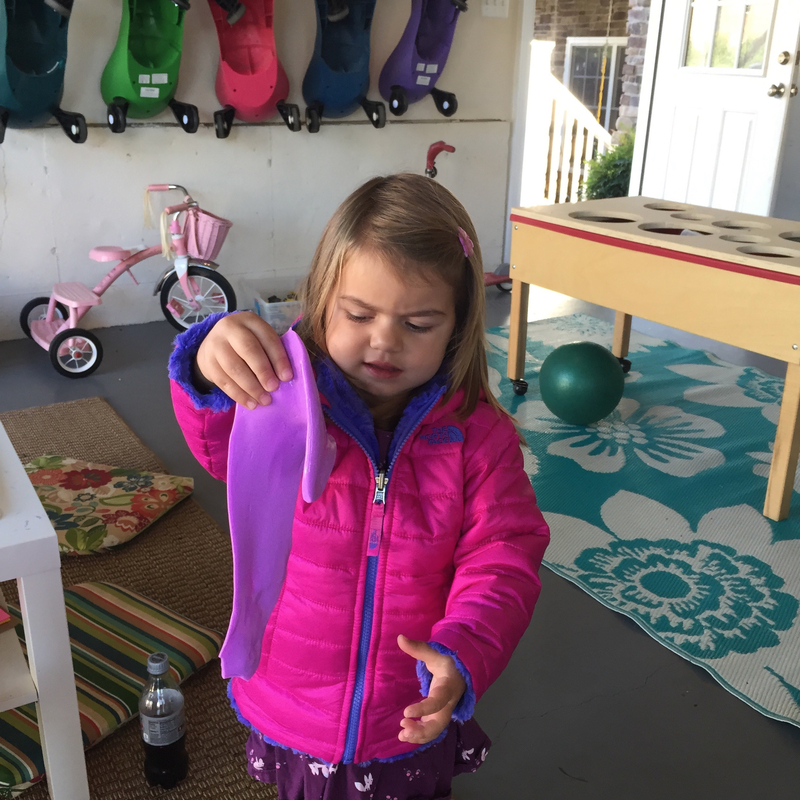 Every time we add a new material we have a guided discovery about that material. My goal for the guided discoveries are to show everyone what the new materials are, how to care for them, how to clean them up, and where they are stored in the classroom. As a disclaimer, I do my best to take lots and lots of photos around the classroom in the mornings. Please don’t get discouraged if you don’t see your child in lots of the photos. I promise there will be posts with lots of pictures of everyone as the year goes on. Some days just get busy and I don’t have as many chances to take photos. I opened the easels this week! 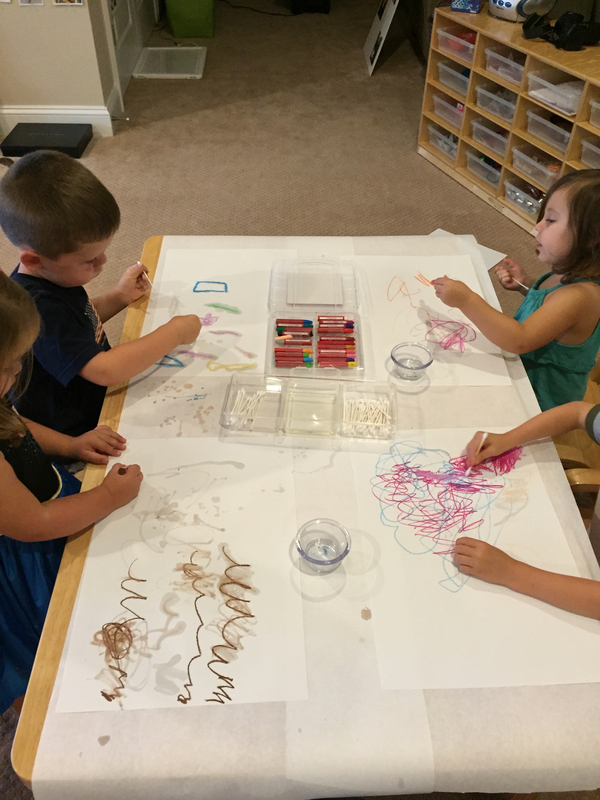 We discussed painting in the classroom, cleaning up, where to find smocks, how to put on smoack, and where to find paint brushes. I only put yellow, red, and blue paints at the easels. We these three colors the children have been seeing lots and lots of color mixing happening while they paint on the easels. 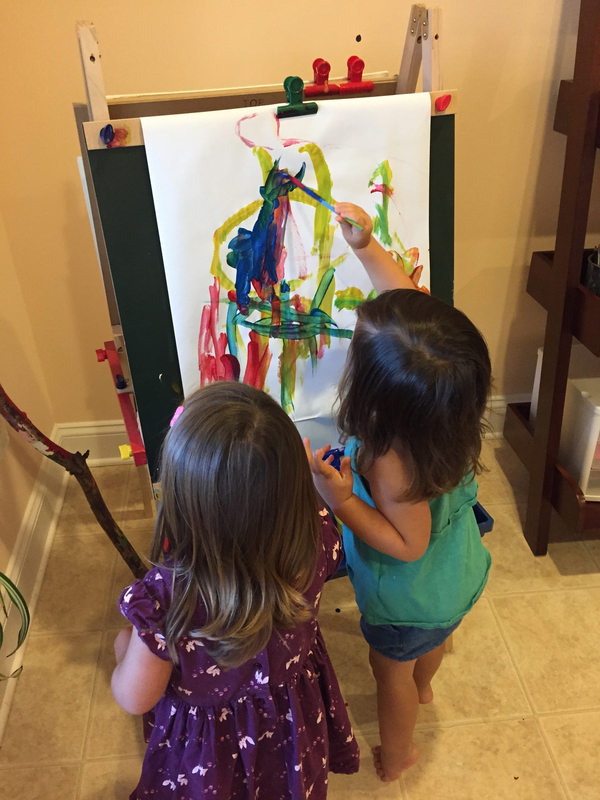 J and A are working on a collaborative painting! 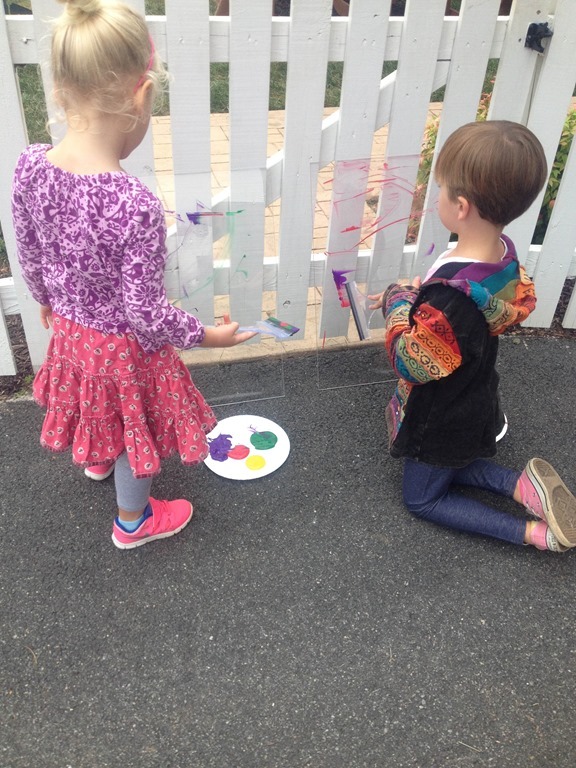 This was an activity the children had access to outside last week. 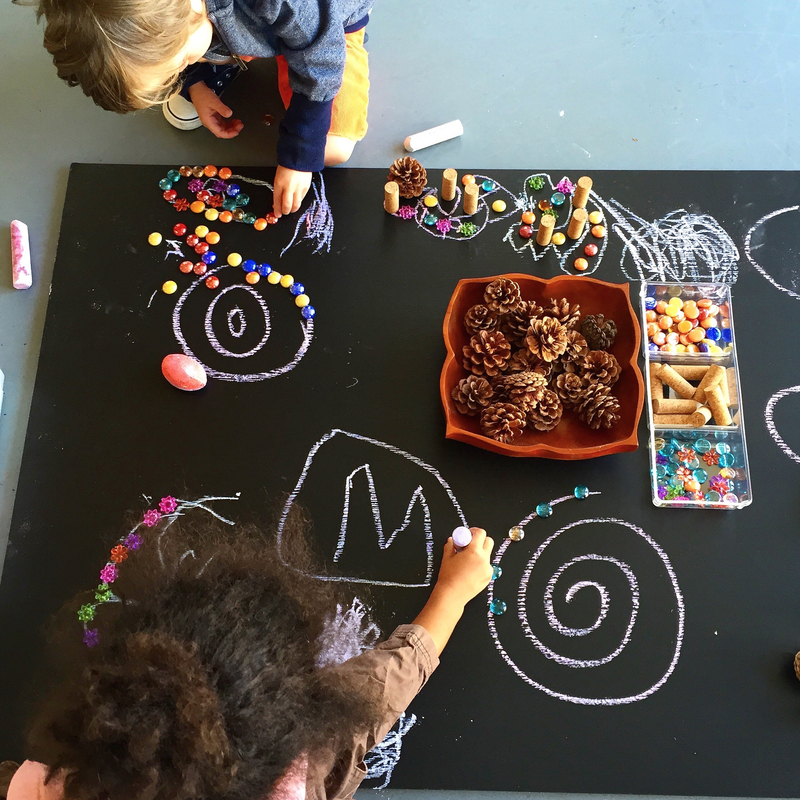 I painted an old train table with chalkboard paint and then I added chalk and lots of loose parts. 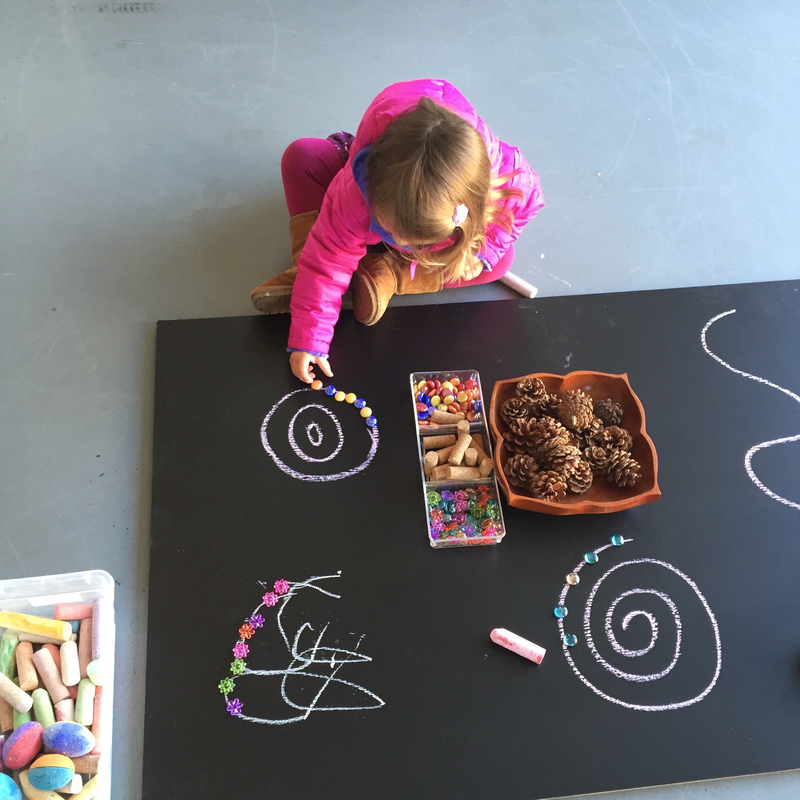 I drew different lines and swirls onto the chalk board. 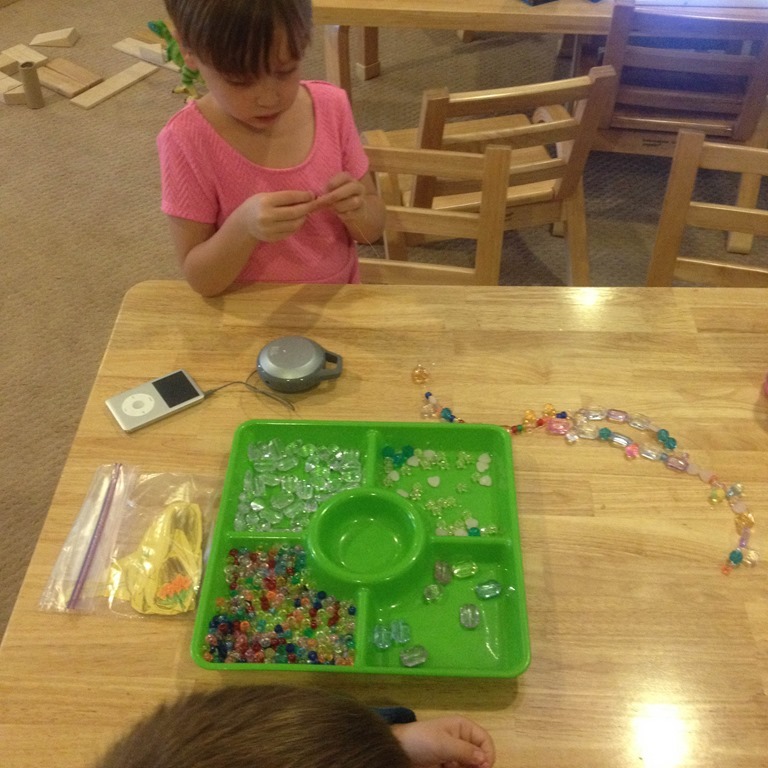 Then they were offered a bunch of different loose parts to put ontop of the lines. They could lay them out in a pattern or add them in a unique way to the lines. 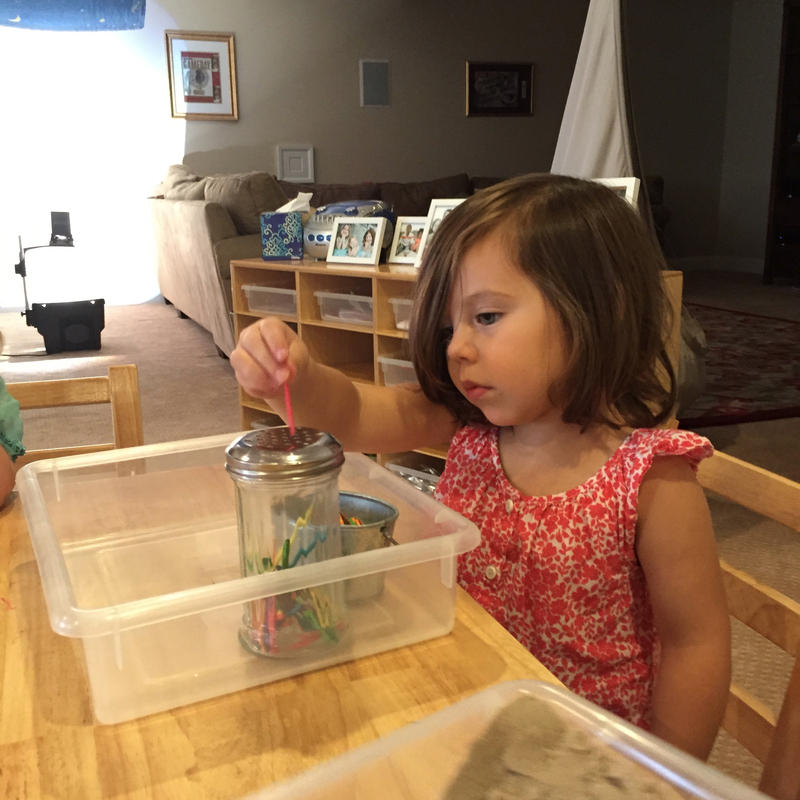 This activity develops counting, math skills, fine motor skills, reasoning, spacial awareness, and creativity. 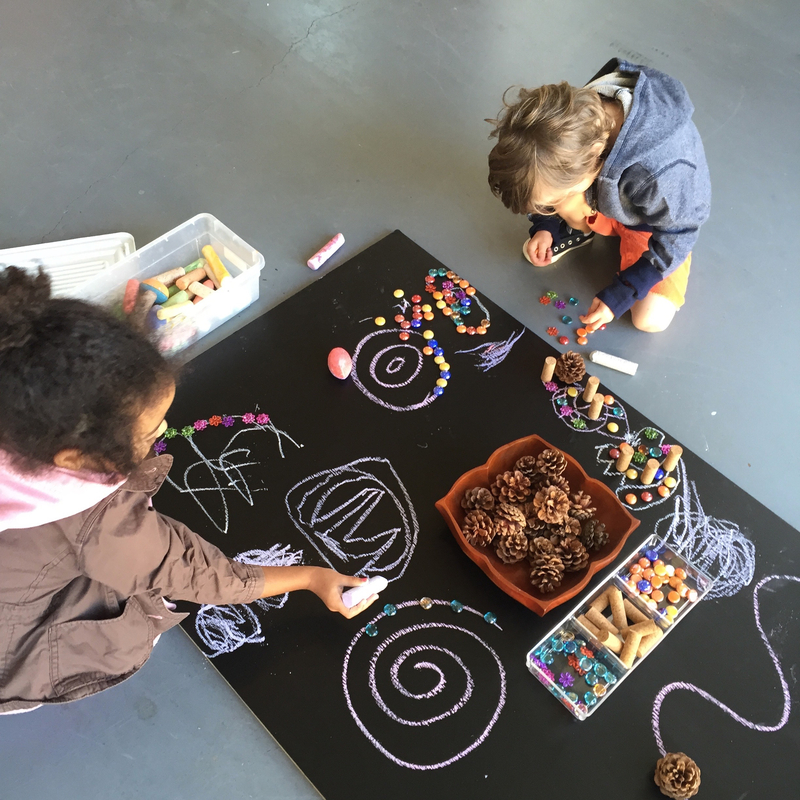 Many of the children took the lead and made their own lines or areas to create unique designs with the chalk and the loose parts! 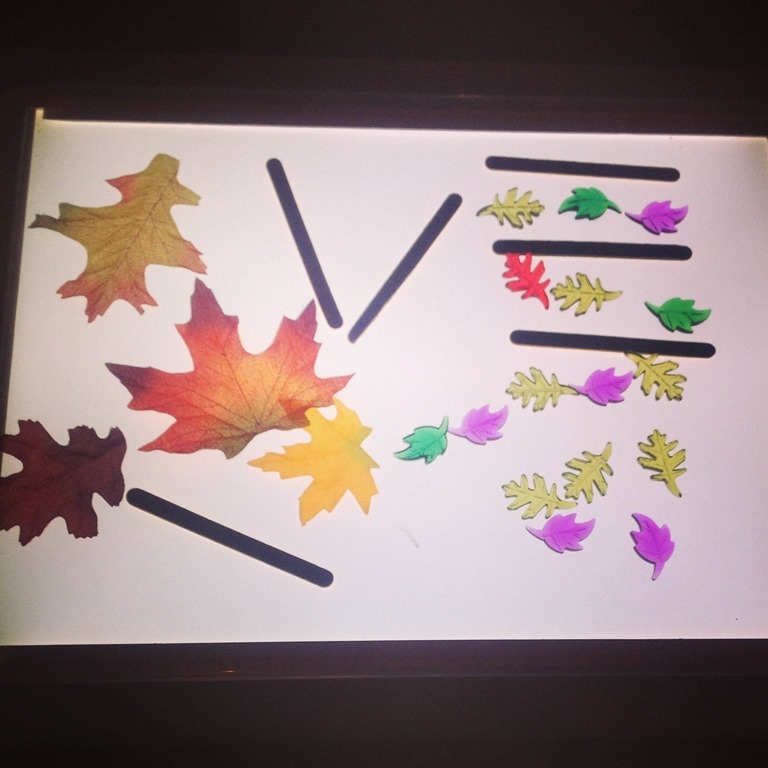 I gathered up all of my color blocks and window blocks into one location for a color provocation on the light table! I also added some color chain links! 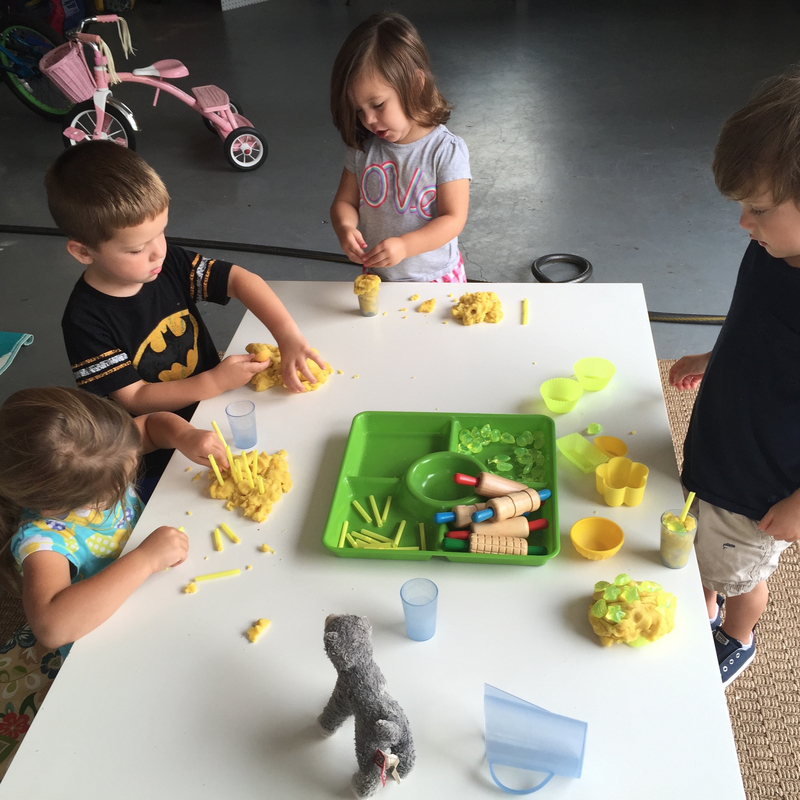 We have loved our new play dough, which I dyed yellow and added a lemon scent to it! 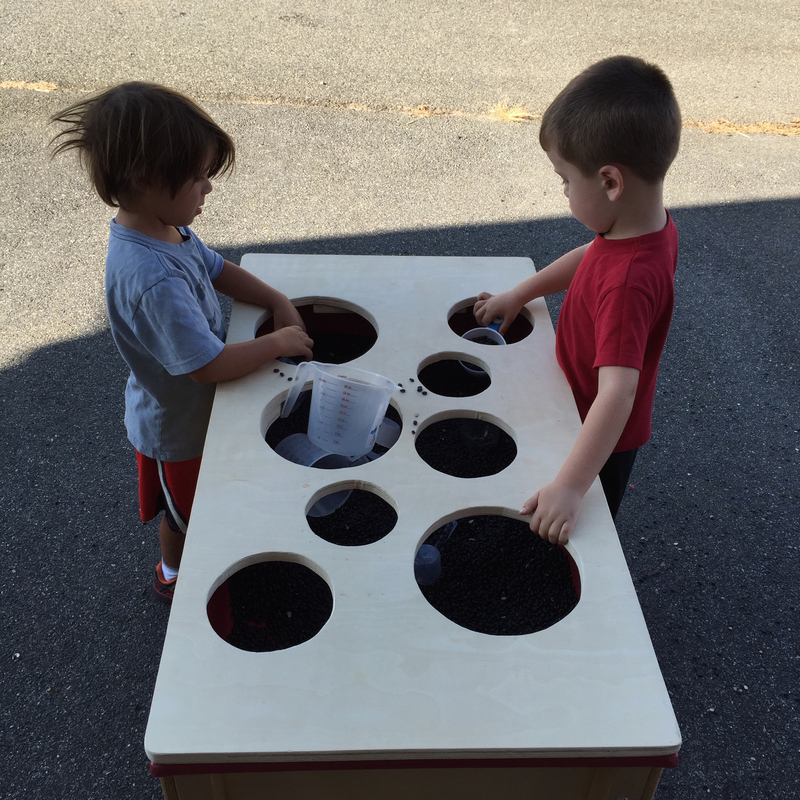 We played with it outside on the tables and also for a few days inside the classroom. 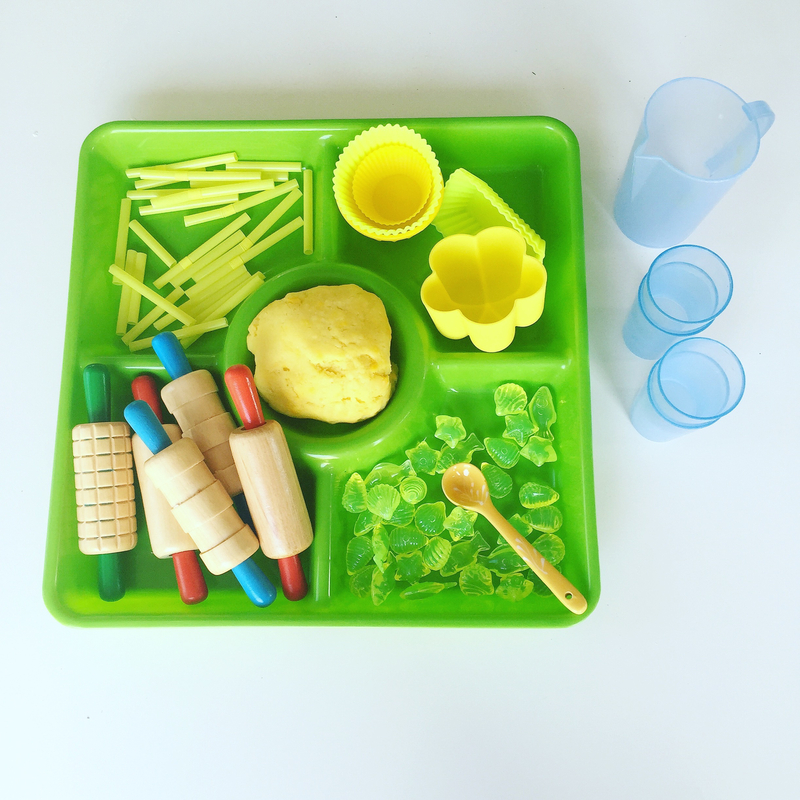 Other items on the play dough tray were cut up straws, yellow gems, yellow play dough liners, and little cups and a little pitcher. 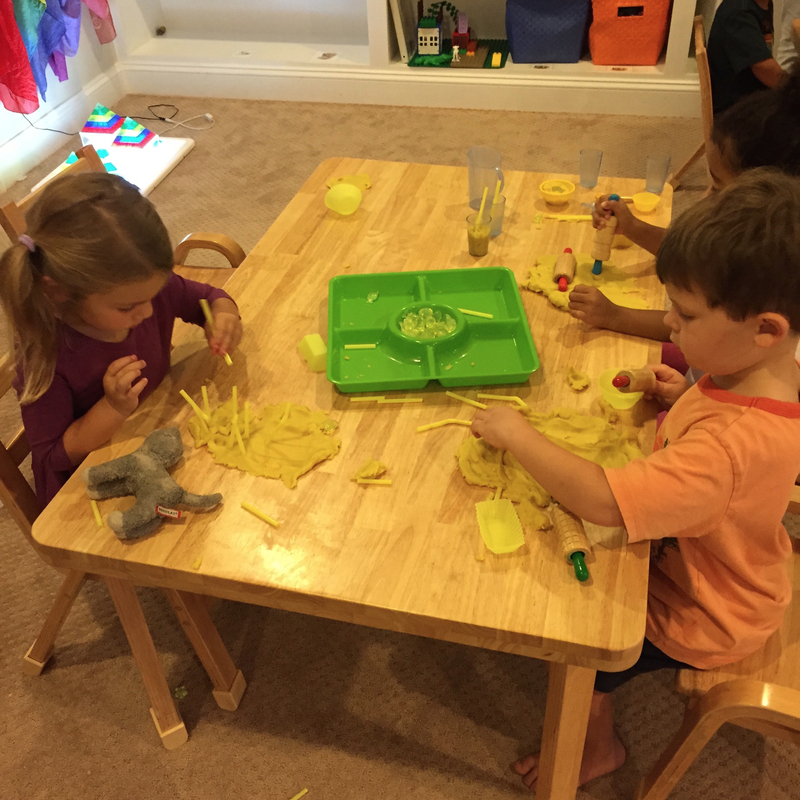 The cut up straws were used a lot and a great source of interest to their play dough creations. I love the above photo of D pretending to pour some play dough lemonade! 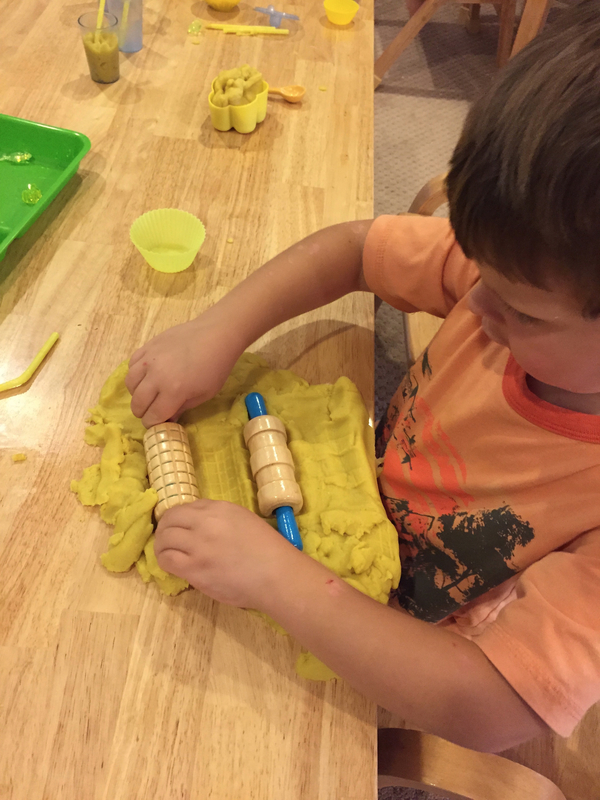 H was very interested in the textured rollers, and creating different impressions on the play dough. M worked for a good part of the morning on a giant lizard made out of dough! I love Ts use of the straws in the above picture! 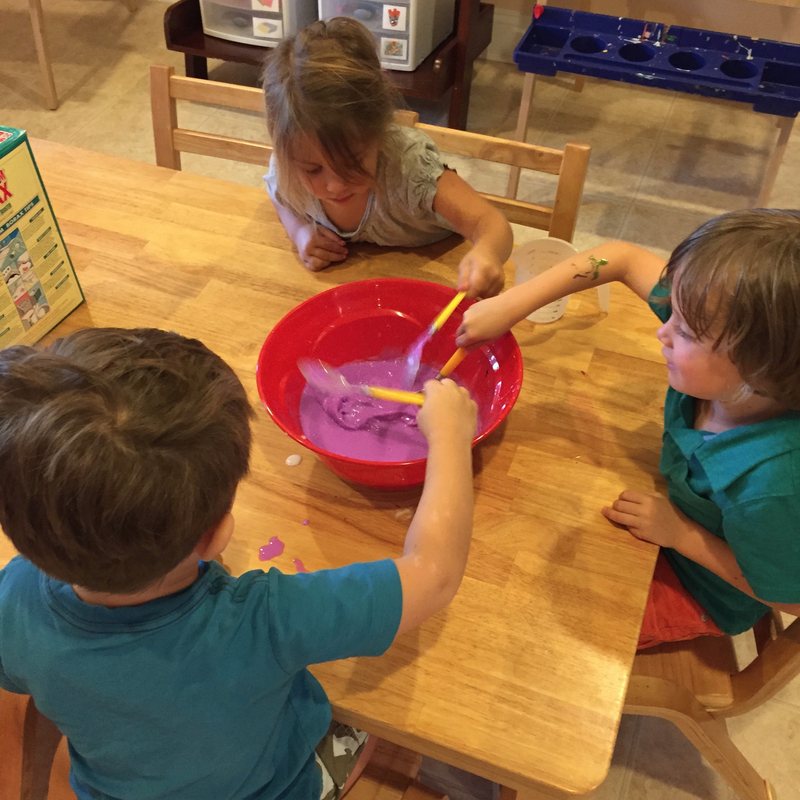 We worked together to make our first batch of Gak. Gak is a mixture of glue, water, and a few tablespoons of borax. 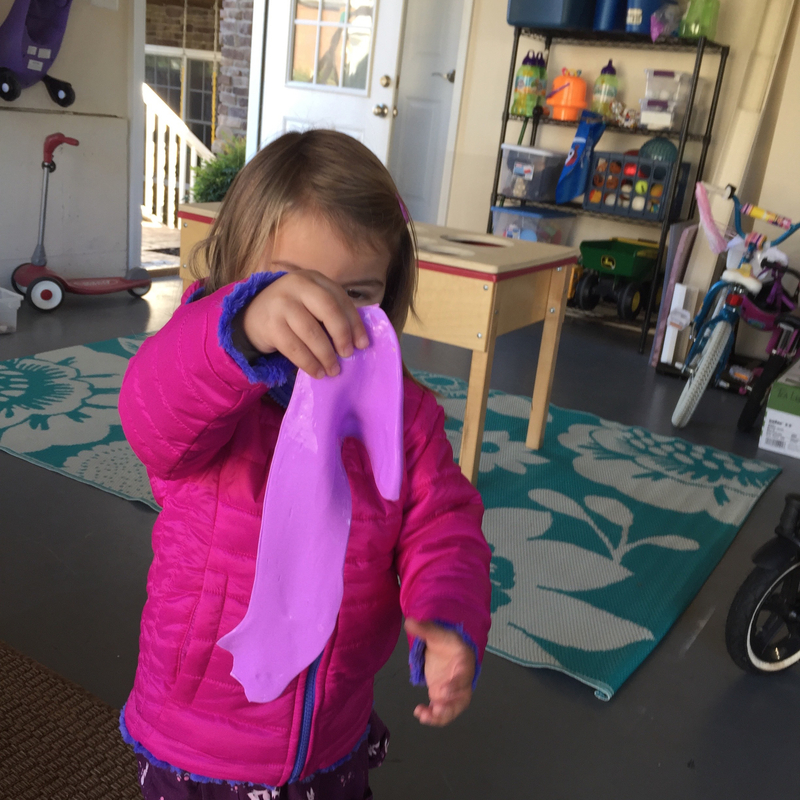 It turns into an interesting slime that is a great texture for sensory. It stretches and moves, but it doens’t leave any residue on hands, which makes it perfect for little children that don’t like to get really messy. 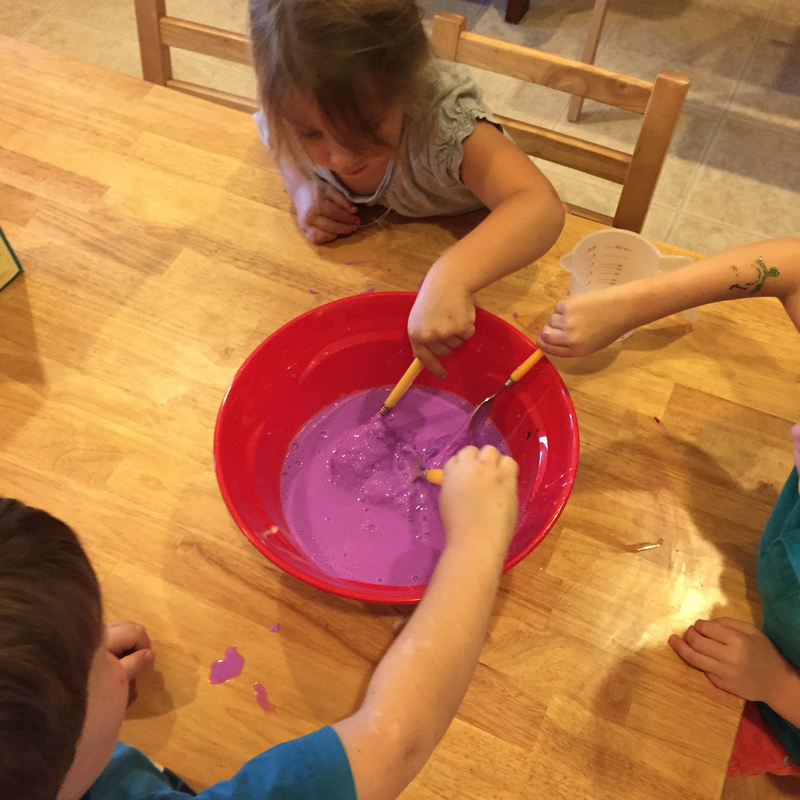 We will be making lots of Gak this year, so I was happy to see they liked their very first experience with it! Once it was mixed completed, I separated the Gak into different piles for each child and gave them a few gems to squish into their Gak. 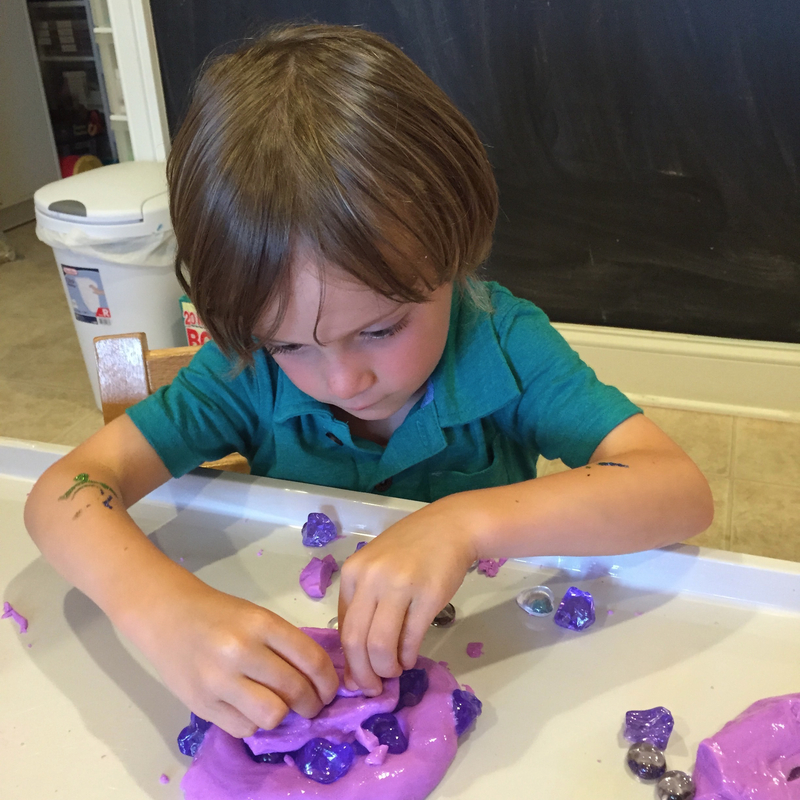 C is working intently on a huge pile of Gak and gems. J spent a lot of time outside exploring the Gak and watching it stretch when we held it up really high. J and A helped me make our first batch of “Clean Mud.” First we shredded two bars of white soap. 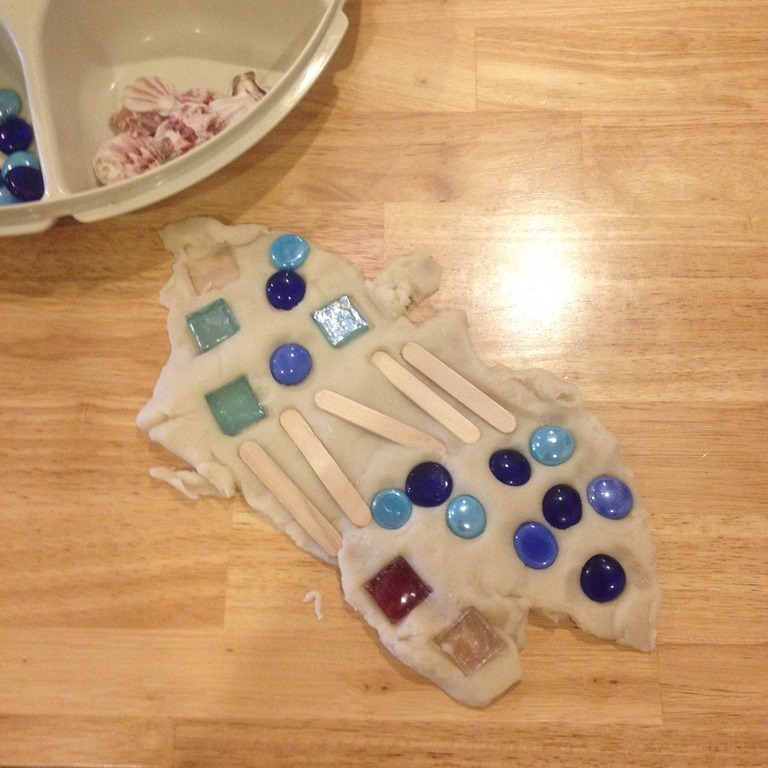 Interestingly enough, J and A LOVED the white soap pieces. They spent a long time scooping them and pouring them. They offered such a fabulous smell too! The second step was to unroll an entire roll of toilet paper. Lastly, we added a large pitcher of warm water to make the clean mud nice and foamy and squishy. As soon as it turned into mud J and A walked away from the activity. 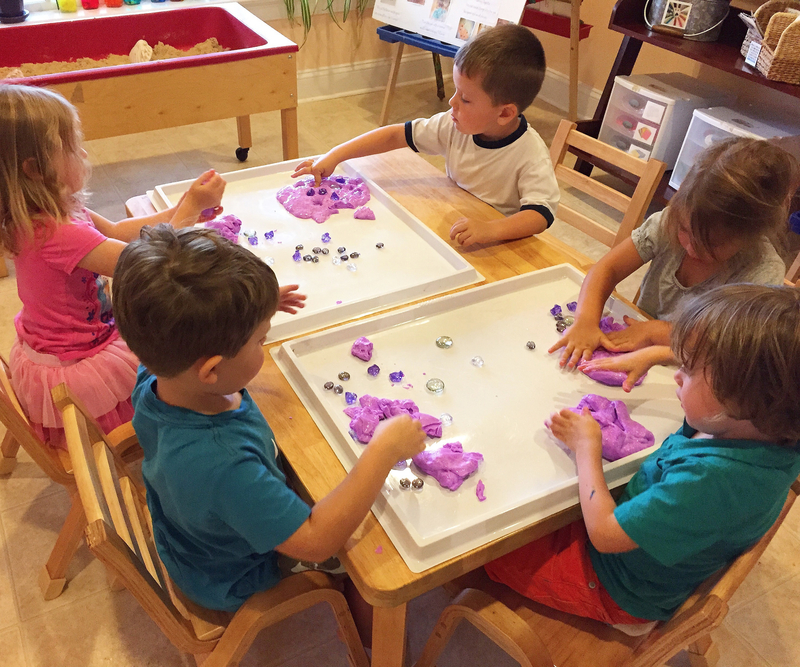 This clean mud is very squishy and will leave their hands feeling wet and foamy. They were not interested in messy hands! They sure did love making the mud with me though! Our finaly product of clean mud! My father came over a few weeks ago and made this fabulous top to our sensory tub. It is a wooden board with many different sized holes cut into the top of the board. I added black beans and many different types of scoops underneath the board. 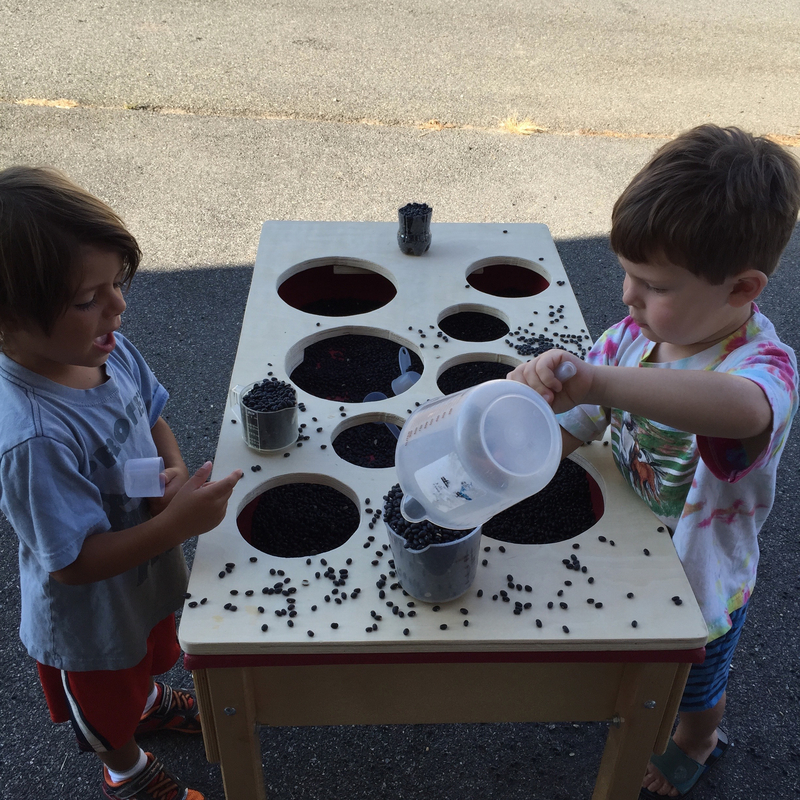 This new sensory top added an inviting level of interest to an average tub of beans. 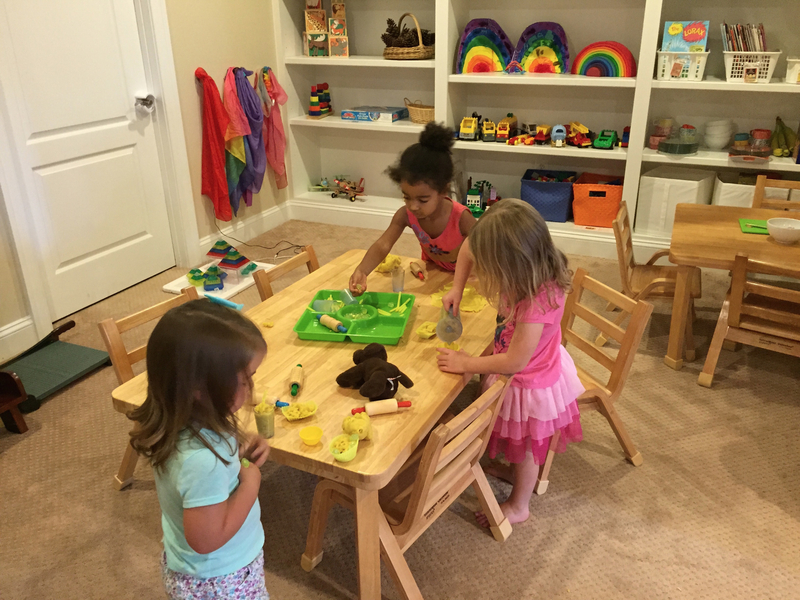 They got busy pouring, scooping, reaching, and trying to figure out this new table! 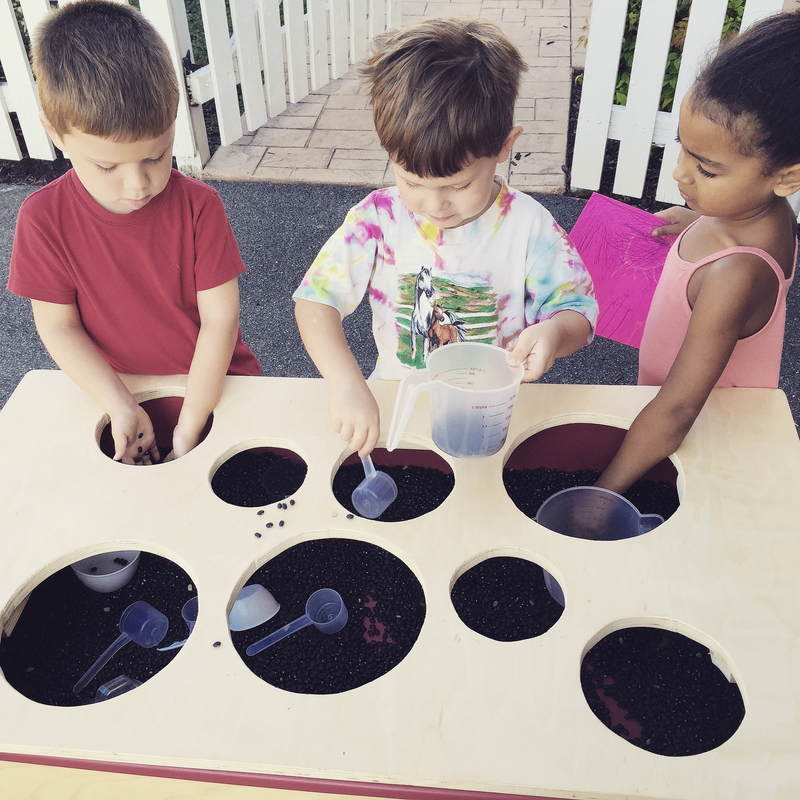 Sensory tables offer so much in the area of open ended play, but they give the children lots of chances to practice pouring, scooping, measuring and judging capacity. They also get the children talking to each other, comparing notes, and sharing their equipment. You can see from the photos how busy the sensory tubs are each morning! 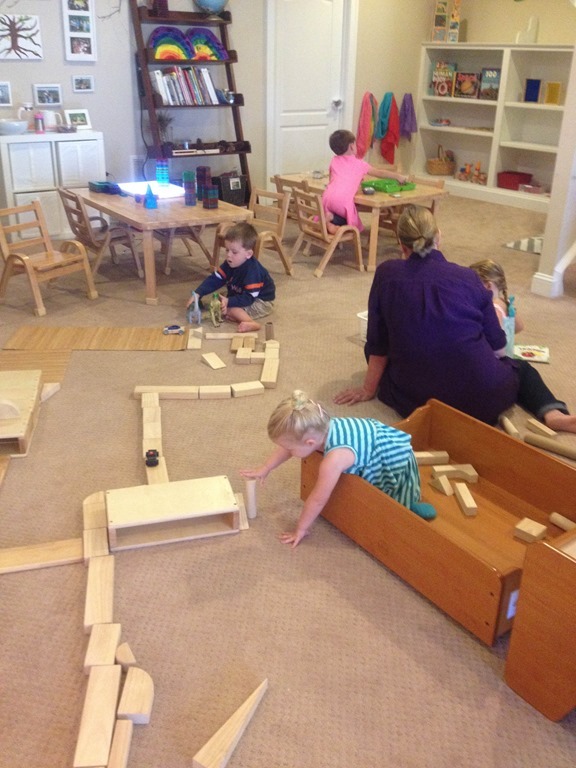 We have had a lot of new block play going on these past few weeks. 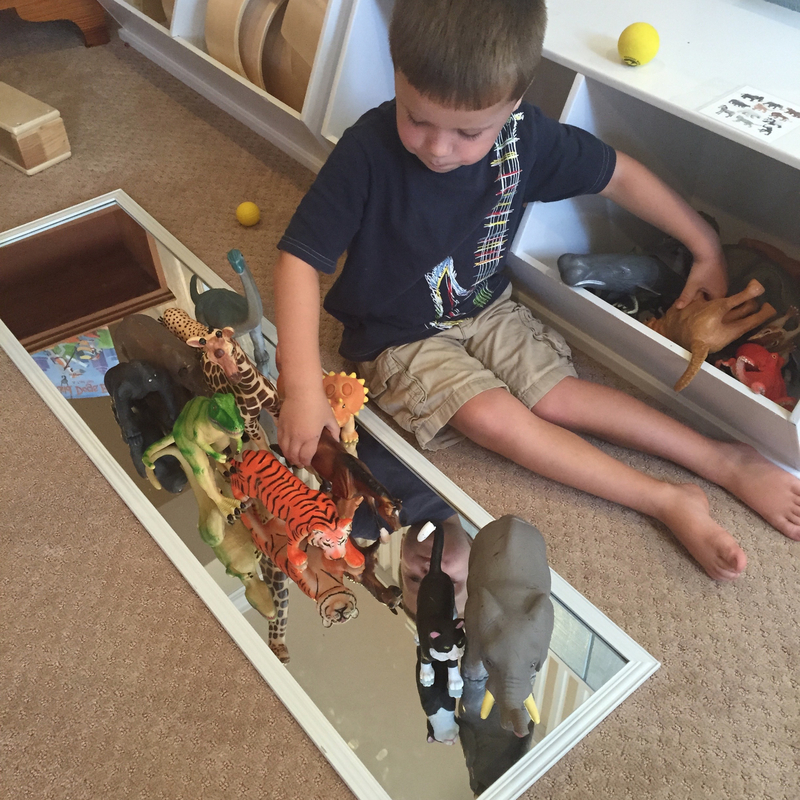 I put the mirror on the floor for some added interest, and D got right to work stacking animals ontop of the mirror. We discussed their reflections in the mirror. 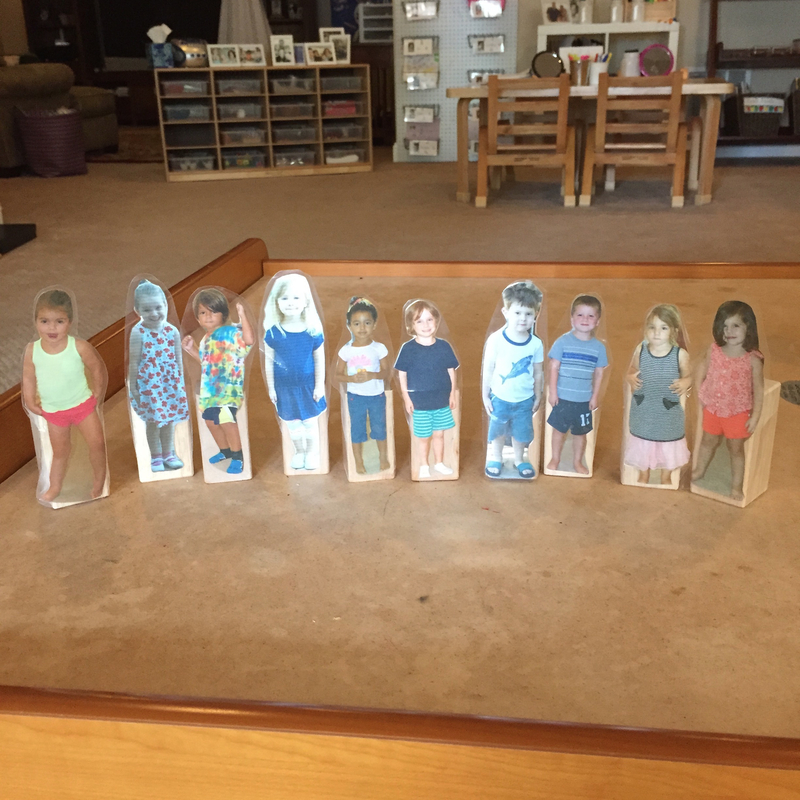 I also made these block people for the class. 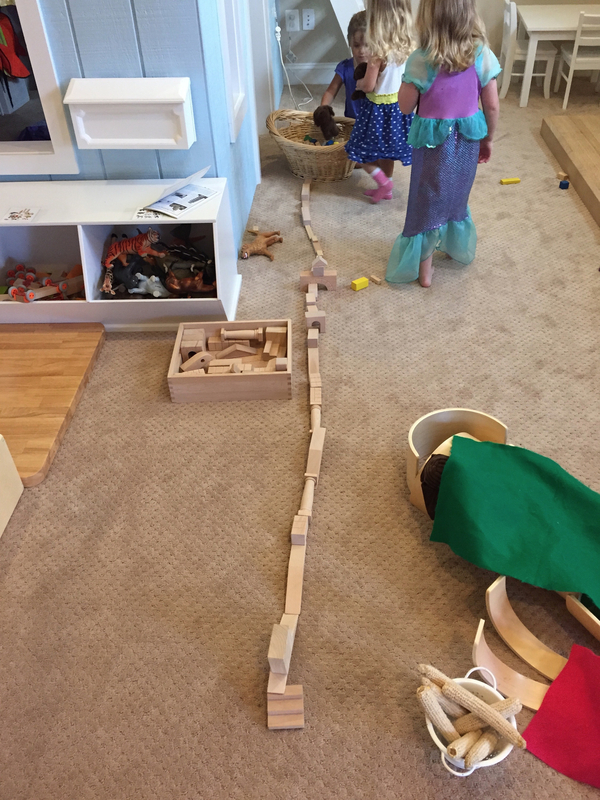 These blocks were a wonderful springboard into imaginative play and also allowing the children to get to know each other better. 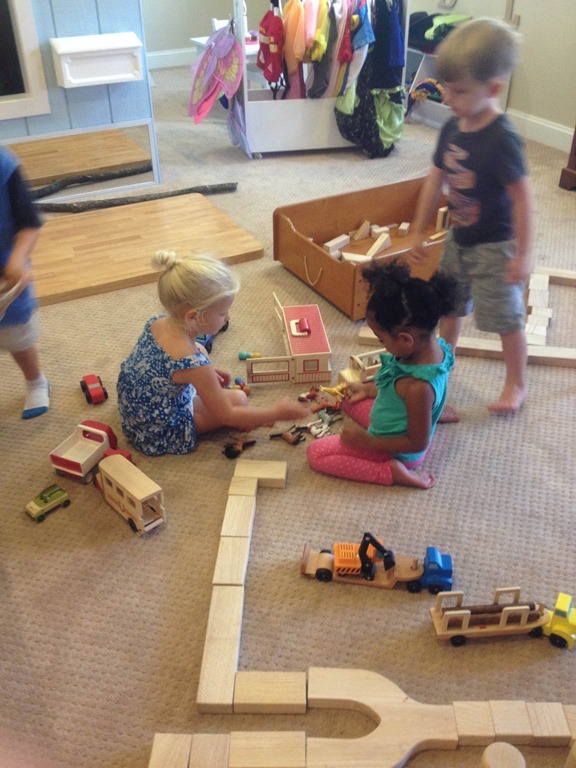 They worked a few mornings on different houses and areas for the people in our class to play and stand. 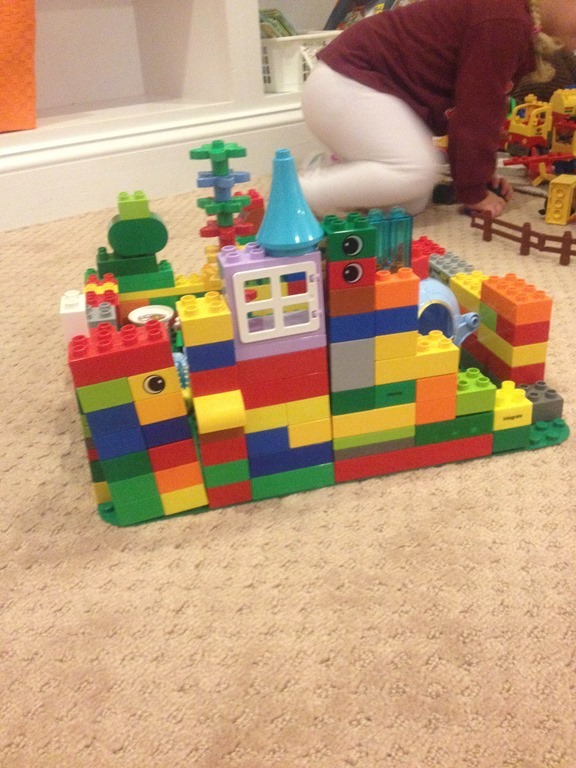 M and H spent the better part of the morning creating an elaborate home with their block people. 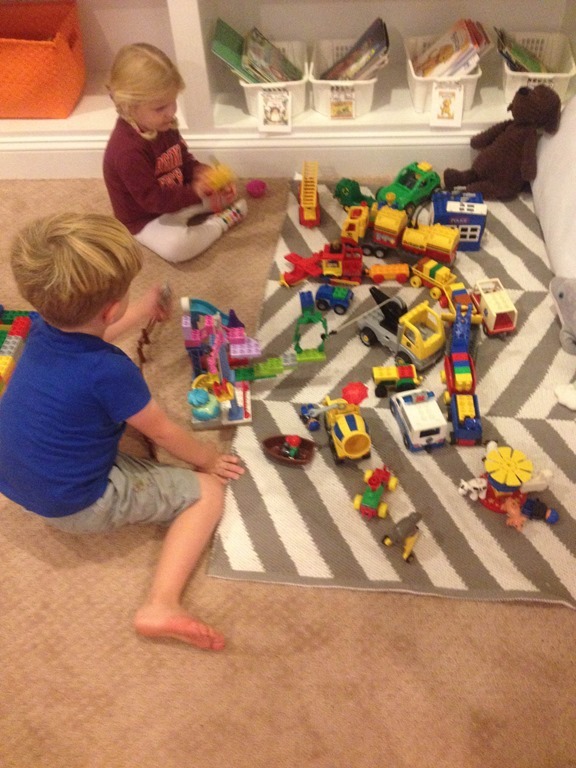 Then they acted out play dates with their block people. One child would be sleeping and the other child would ring the doorbell and wake them up for a play date! 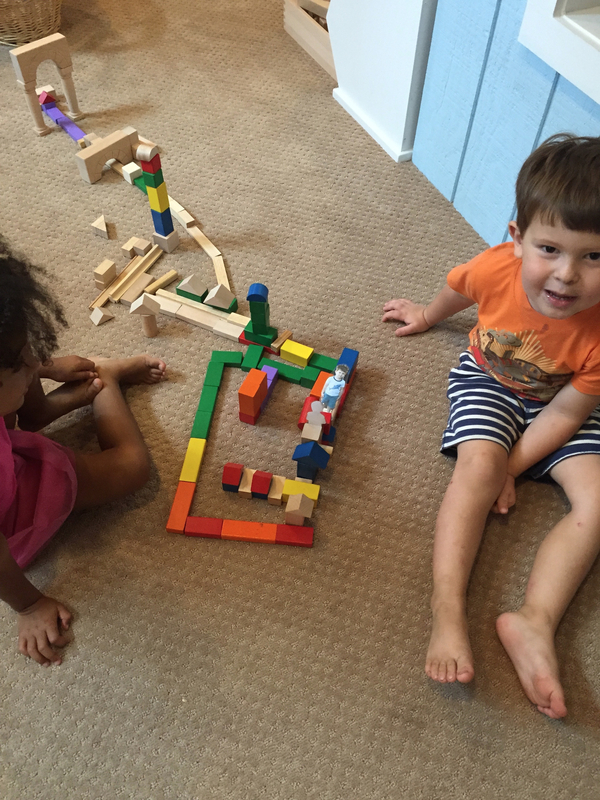 The picture below shows just how large their home area became with the blocks. 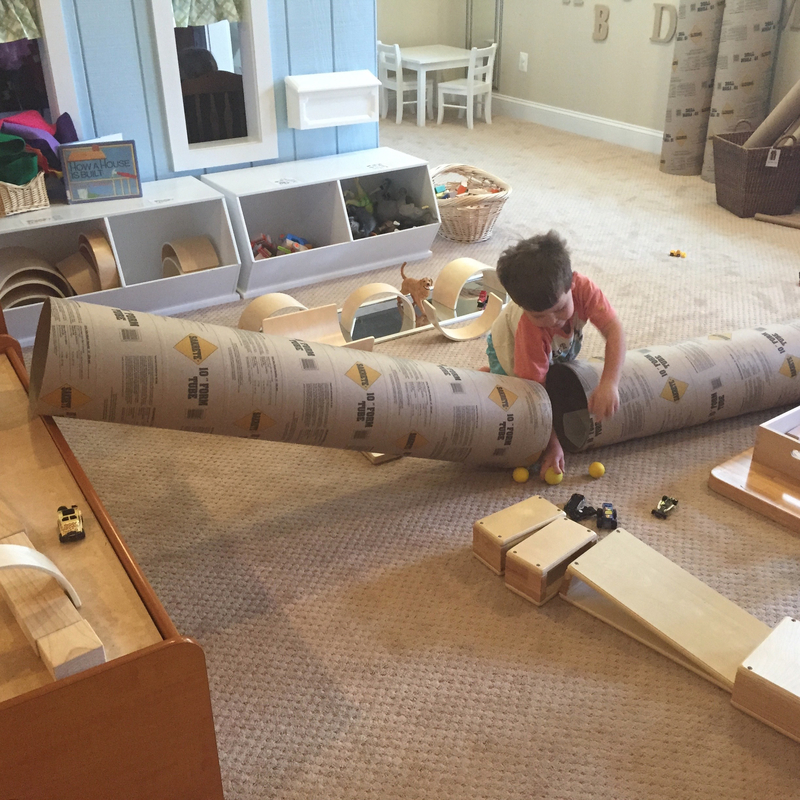 Of course the large tubes and ramps have continued to be a daily play material. Many of the children started playing with the little stuffed animals that they found in the loft. Mrs. Brittany and I got out the hollow blocks and made a pet home. 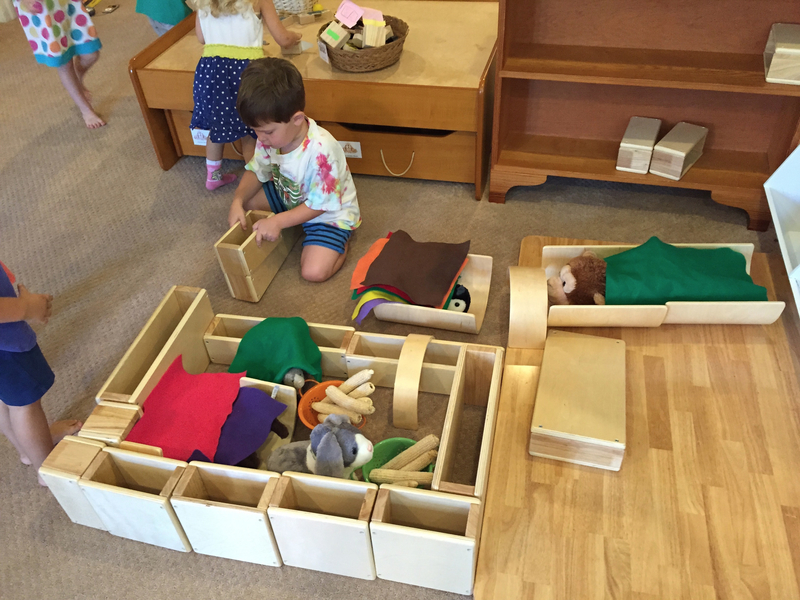 Then the children added many details to the home including beds, blankets, food, and a play area for their pets. Then J and M spent a long time creating the huge doggy obstacle course. Once they finished the obstacle course their doggies had to jump, leap, and scramble over the top of the course to complete the mission. 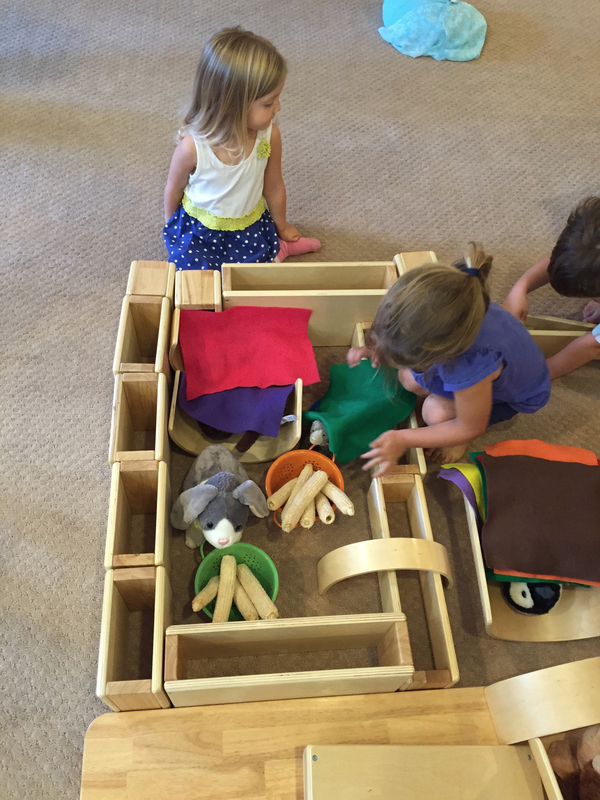 It is amazing to see something as simple as a stuffed animal lead to such imaginative play! 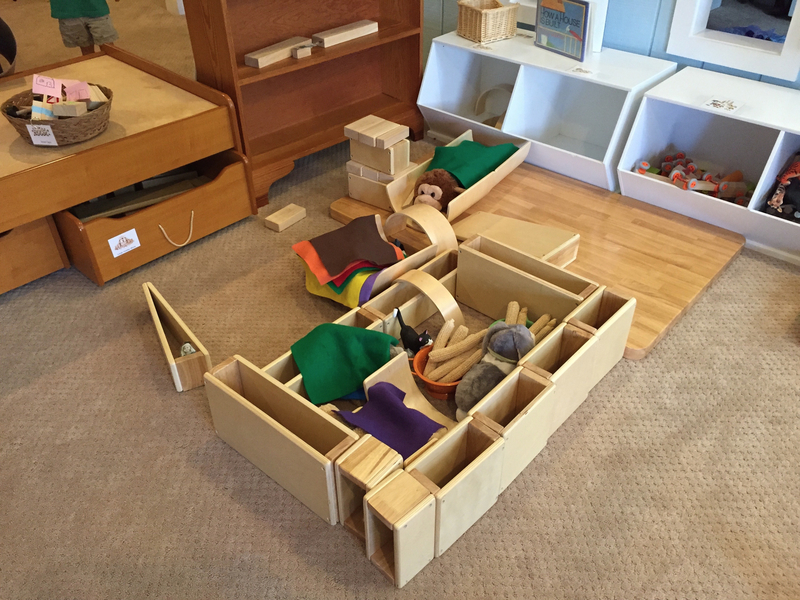 Categories: early childhood education, preschool | Tags: block play, gak, play dough, play matters, reggio inspired, sensory play, sensory tables | Permalink. 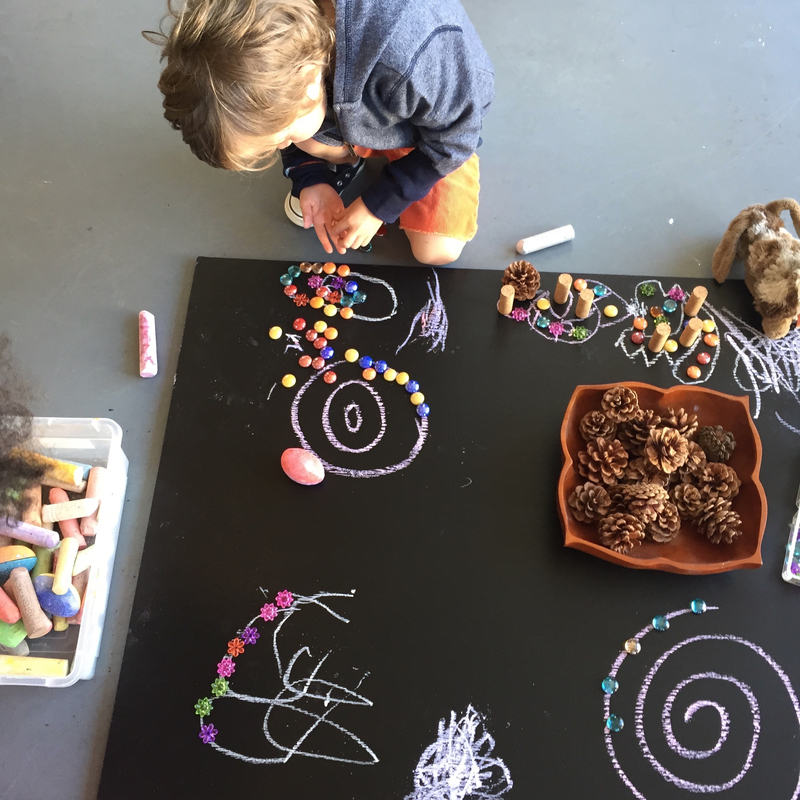 Table Invitations: These are usually open ended activities with simple materials to engage children. 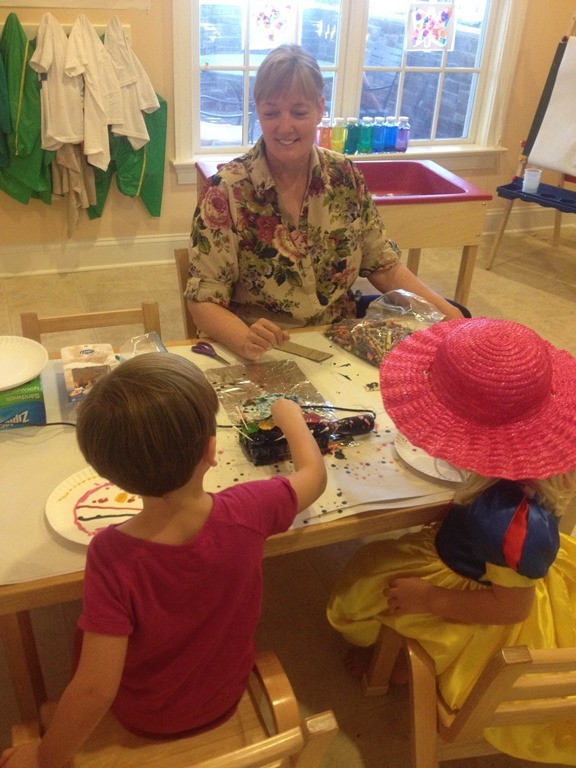 These activities will sometimes be art related, sensory, fine motor, or just seasonal invtiations to play. 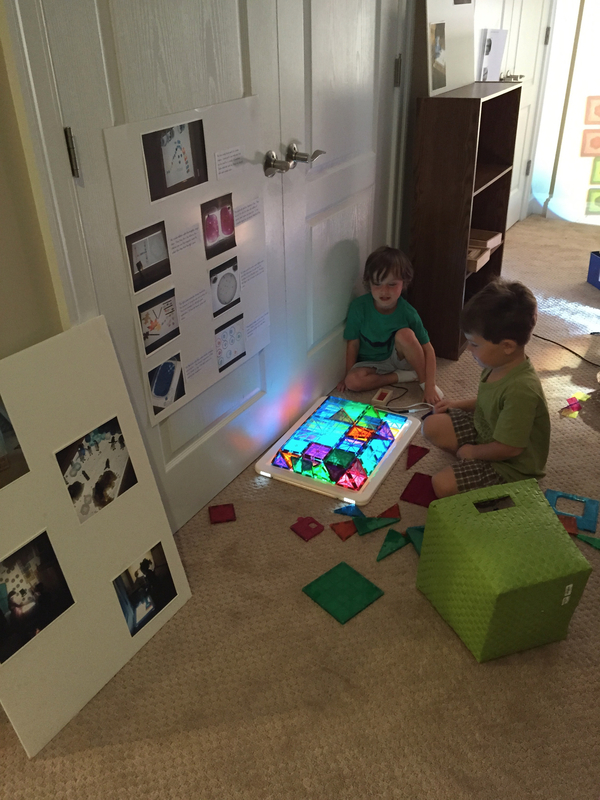 Light Play: The light area is a wonderful sensory experience in our classroom. 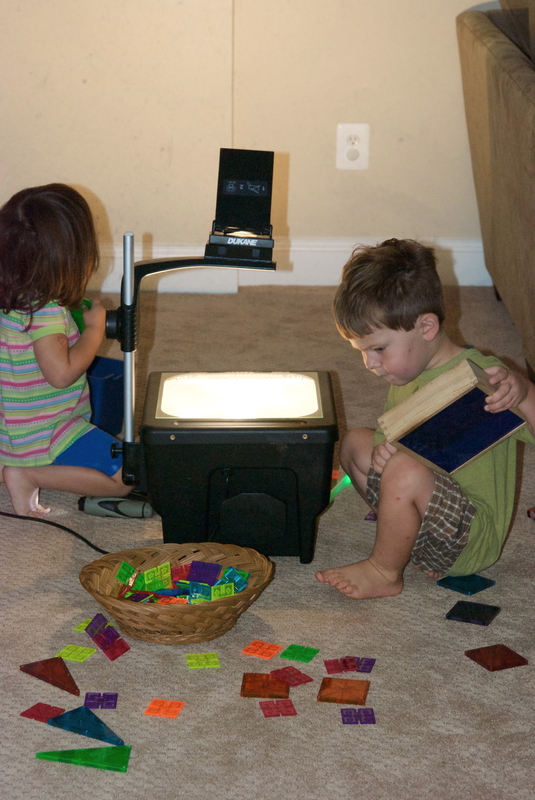 The light play section is defined by any activity on the light panel or with the overhead projector. 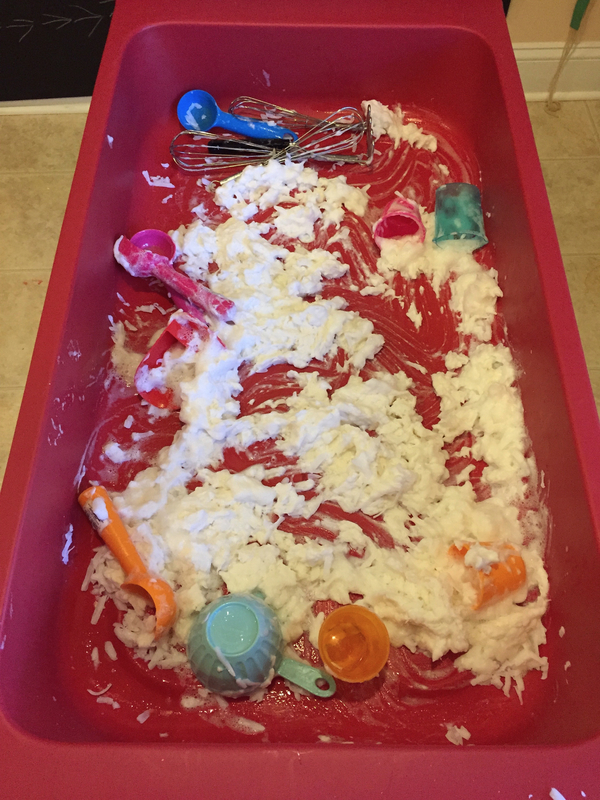 Sensory Play: Sensory play is usually in the large red sensory tubs in the classroom, but it can often be smaller sensory activities we do related to art, getting messy, or engaging our senses! 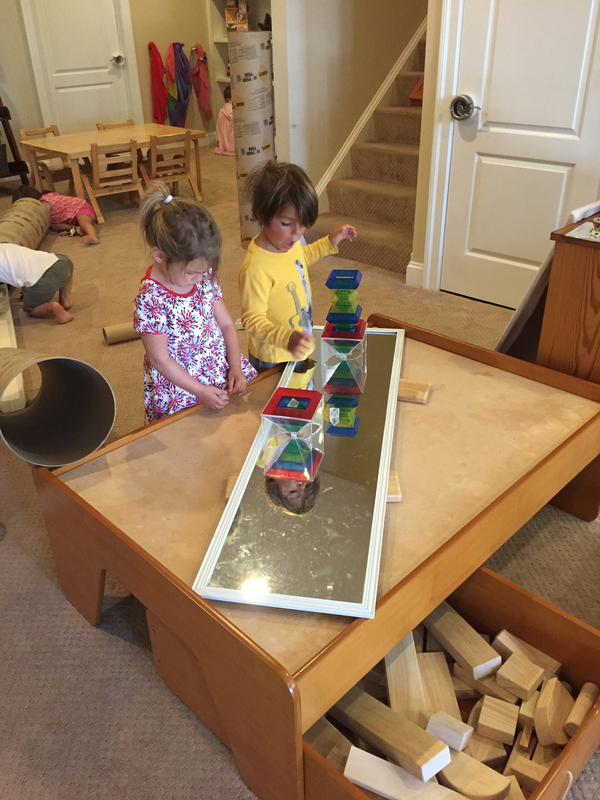 Blocks and Mirrors: This seems to be an a very interesting and ever changing area with our group this year. My blog posts will usually highlight anything new or happenings at the block area. Projects: This is a section where I will use documentation (pictures, words, quotes) to discuss areas we are learning more about in the classroom. Learning Trays: These are the trays in the classroom that children can access at any time. 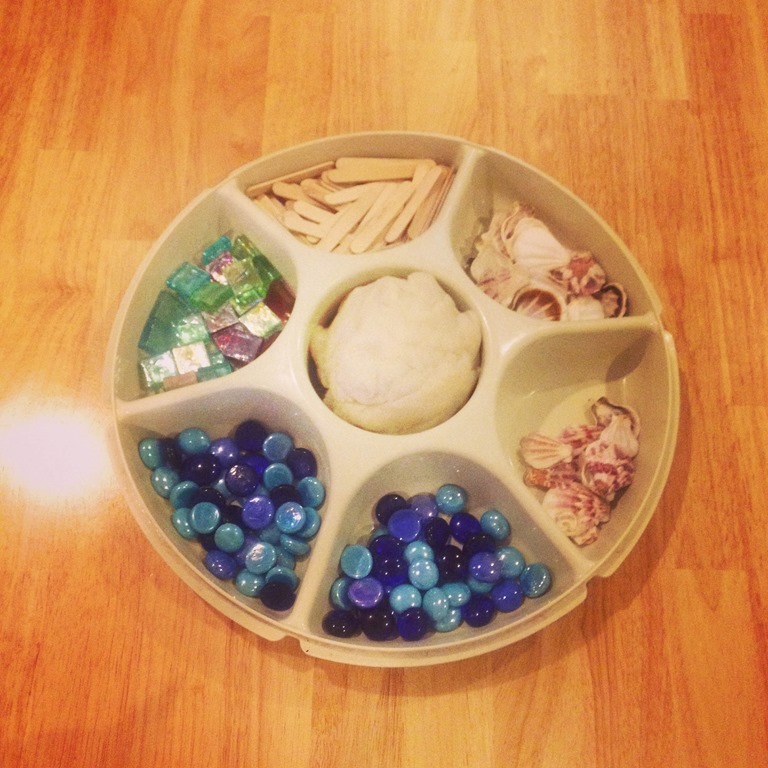 Many of these trays have specific goals or activities for the children to complete. 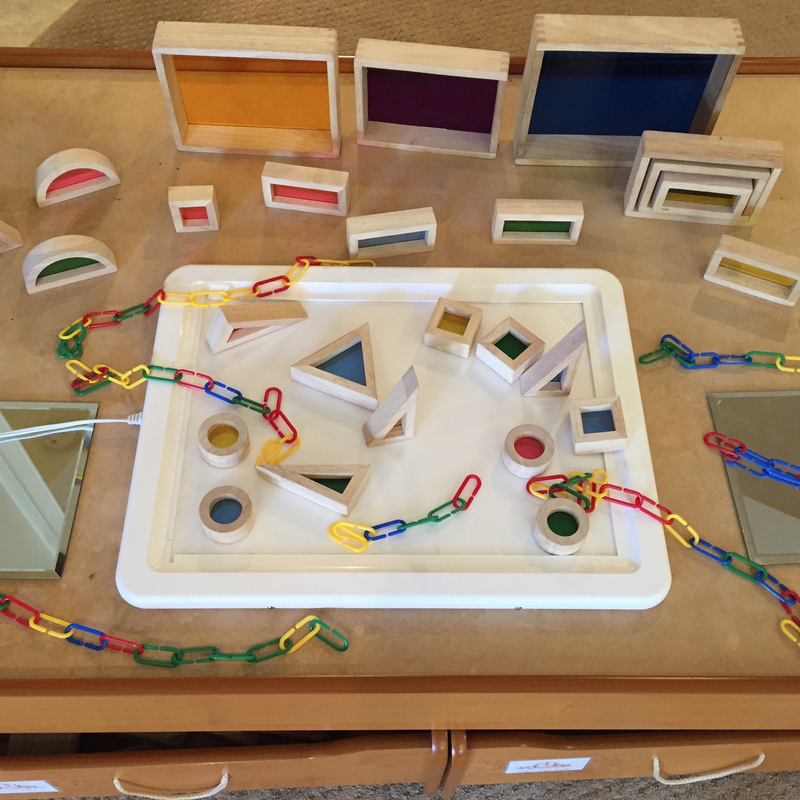 Examples of learning trays are color matching, shape games, math activities, and fine motor activities. Please let me know if there is a section that pops up and you aren’t sure what I am referring too in our classroom day! 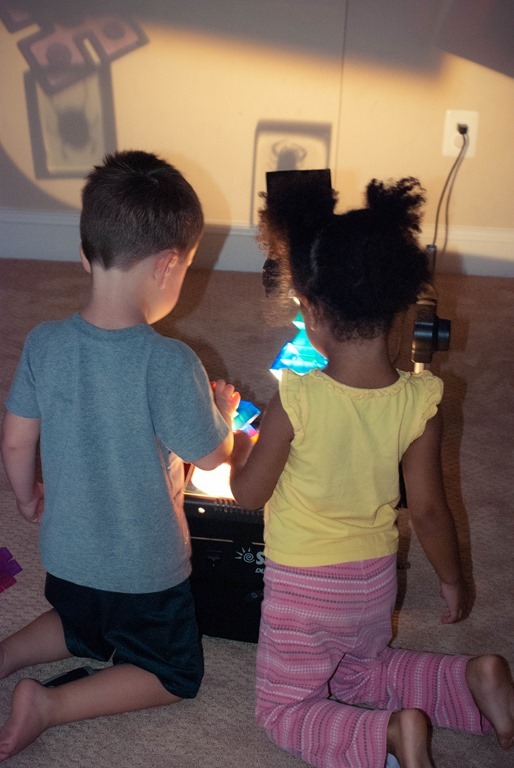 We opened our light area, and there are few different items to explore on both the overhead projector and the light panel. 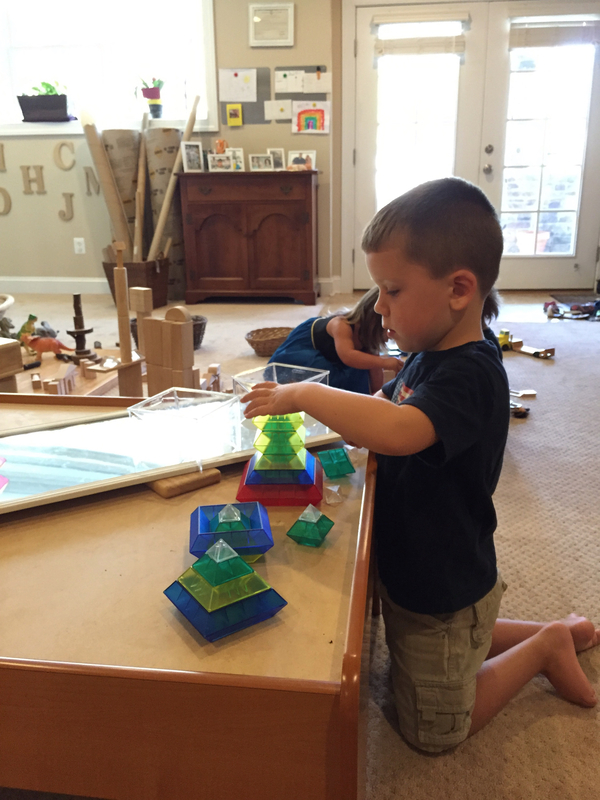 The children have most interested in the Magnatiles, and have been exploring them on a flat surface, three dimensional, and up into towers. D and I built quite a tower! 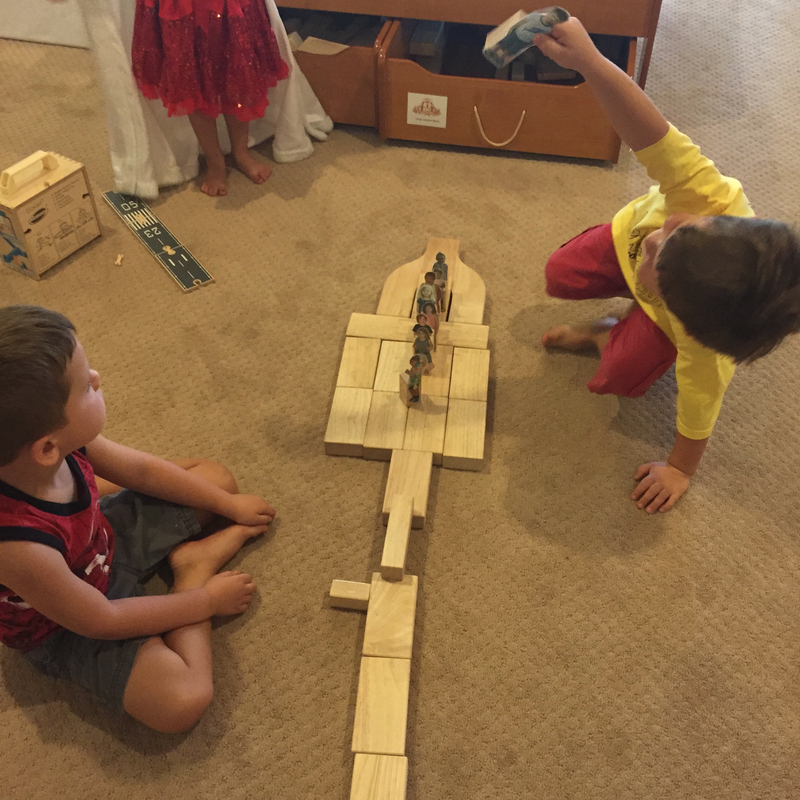 I was so interested to see this 3 dimensional building that C and H worked on for the better part of a morning. 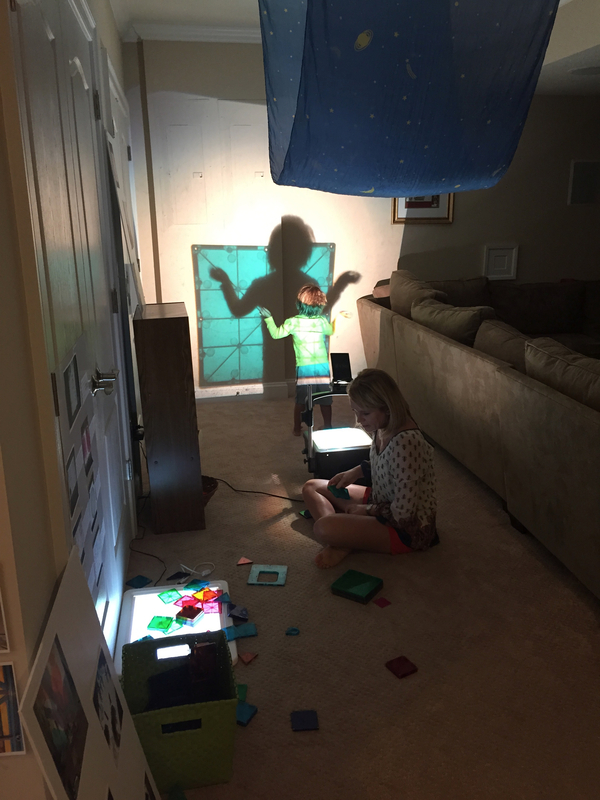 B was playing in the light and talking about his shadow on the wall with the overhead projector. The first week of school I laid out a simple art invitation of paper, oil pastels, and vegetable oil. 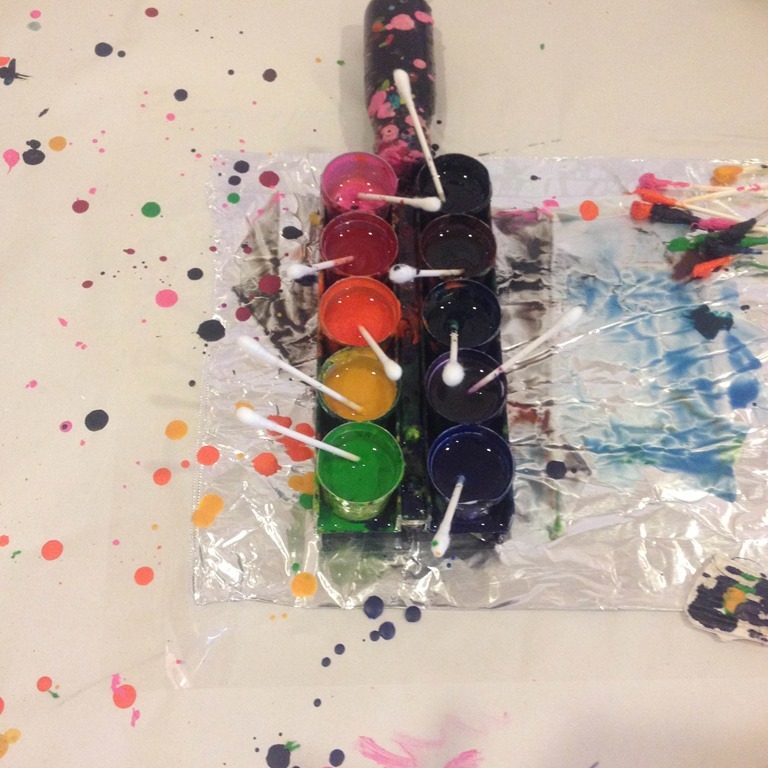 Once the children colored with the oil pastels they dipped the q-tips into the vegetable oil. This changes the oil pastels into a type of paint. We explored this invitation over a couple of days. The children also enjoyed the leftover stickers from last year. They had a great time digging the box and finding many different types of stickers. Then they used crayons and markers to decorate our papers. 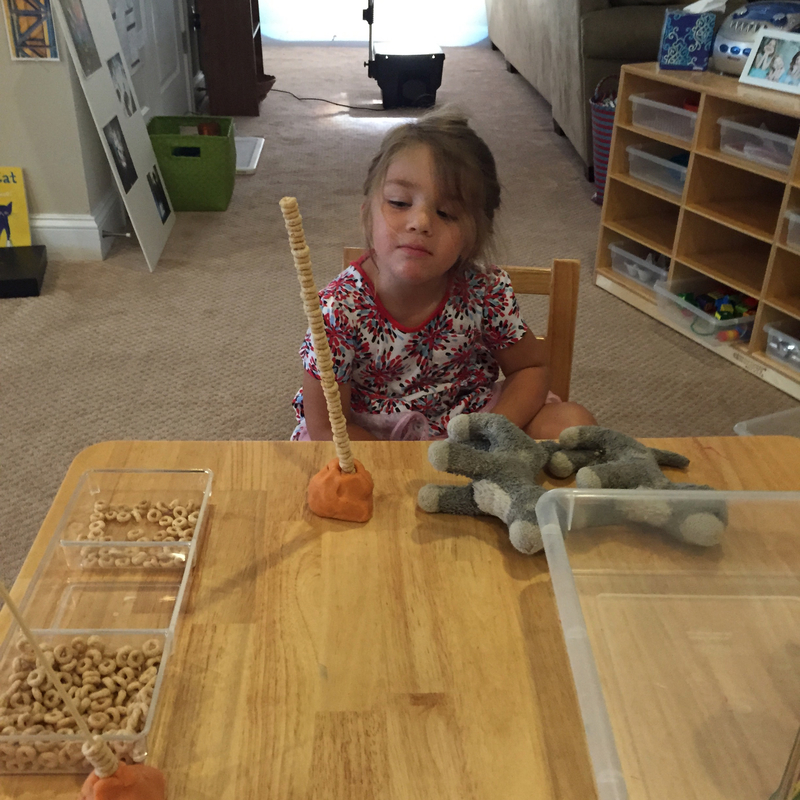 T worked so hard to put each and every cheerio on her tower! 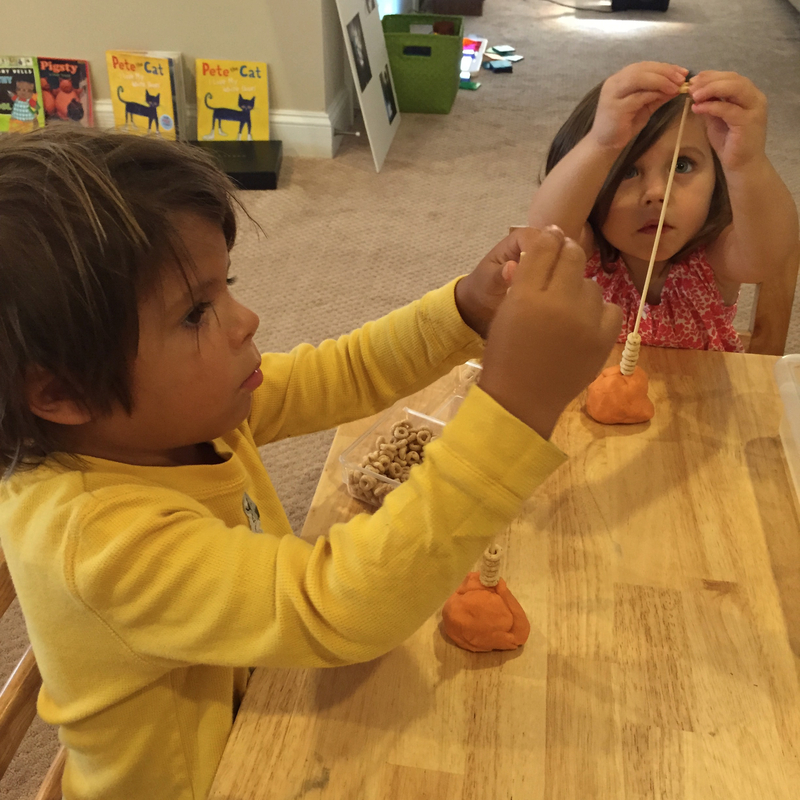 We placed a skewer in a ball of play dough and then very carefully put cheerios onto the skewer. 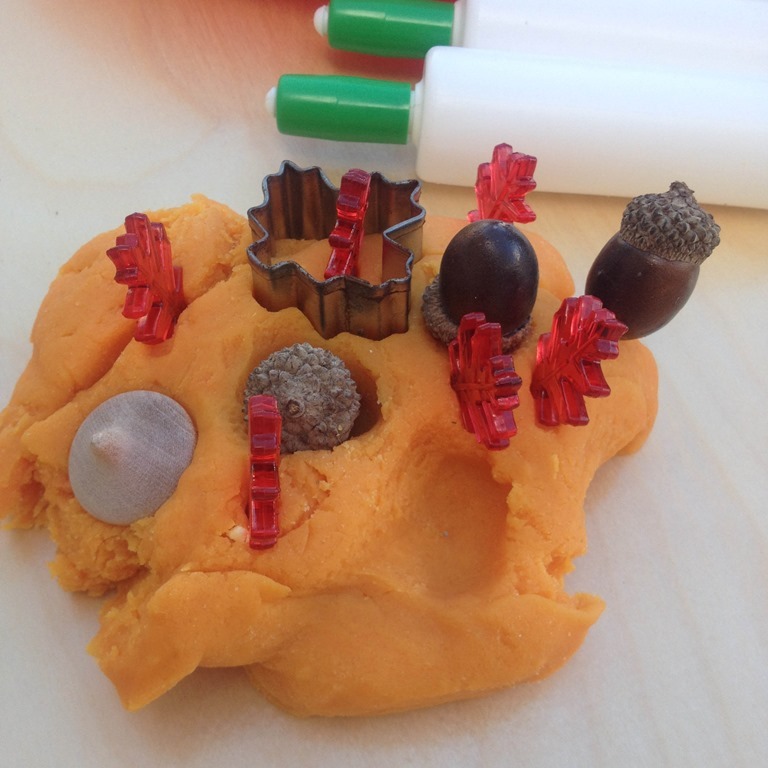 This is a great activity for fine motor building and gaining attention spans. 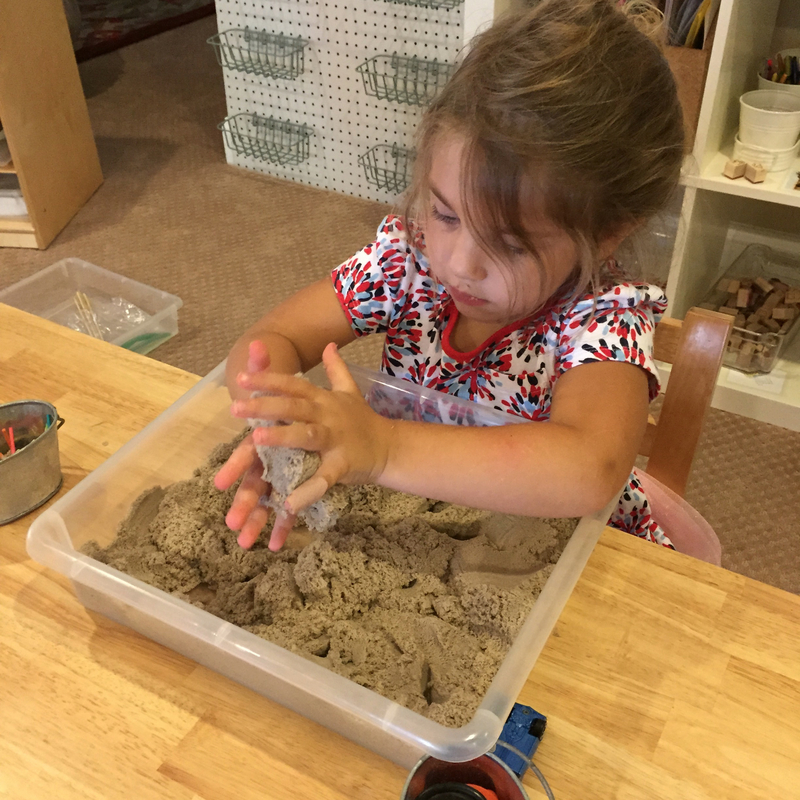 They have also dug around in the tray of kinetic sand. This is such an interesting sensory material to manipulate. 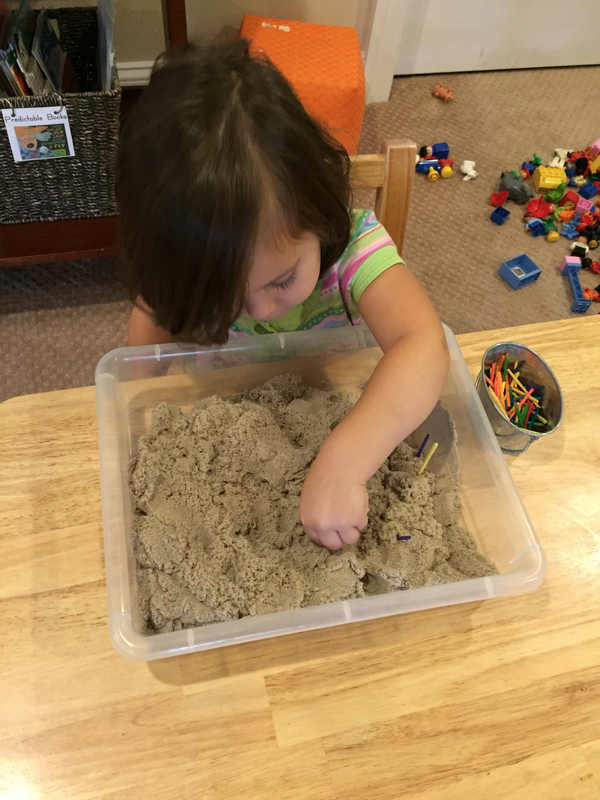 I offered buttons and small colored sticks to dig, hide, and poke into the kinetickenetic sand. We also placed the color sticks into a parmesan cheese shaker. 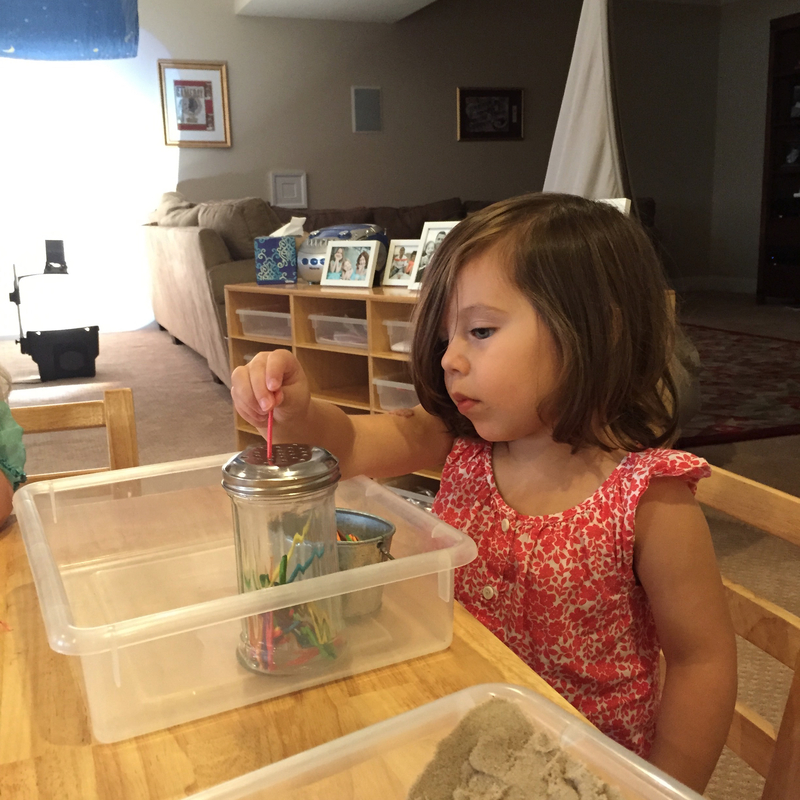 This is another great fine motor activity building the pincher grip and hand-eye coordination. Everyone also stopped by to explore our Wedgits on top of the long mirror. We did a lot of building, crashing and starting over and over again. 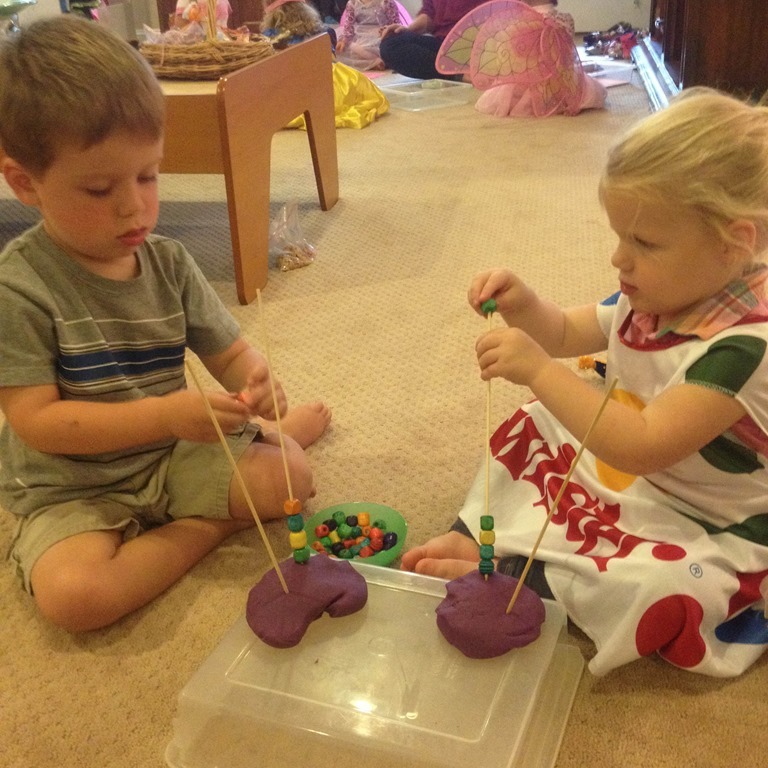 Wedgits are a great manipulative and provide lots of open ended exploration. 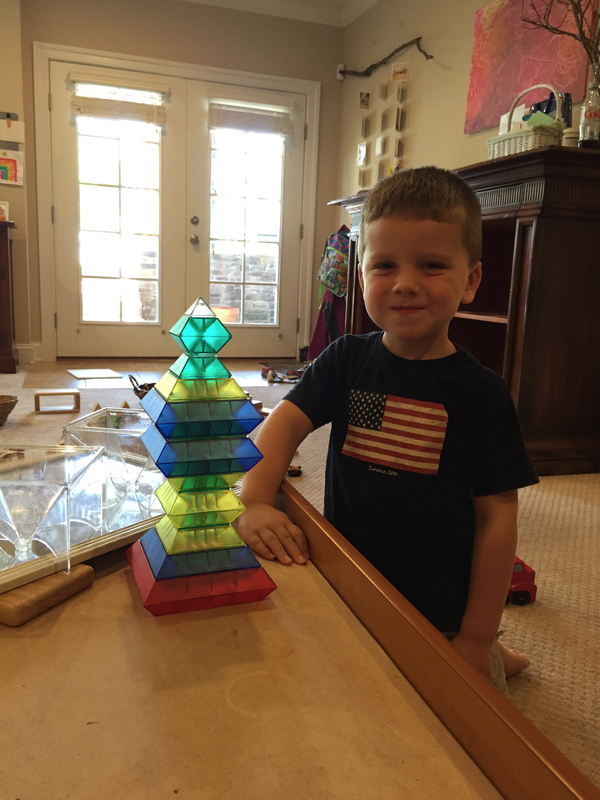 D is proud of his creation! 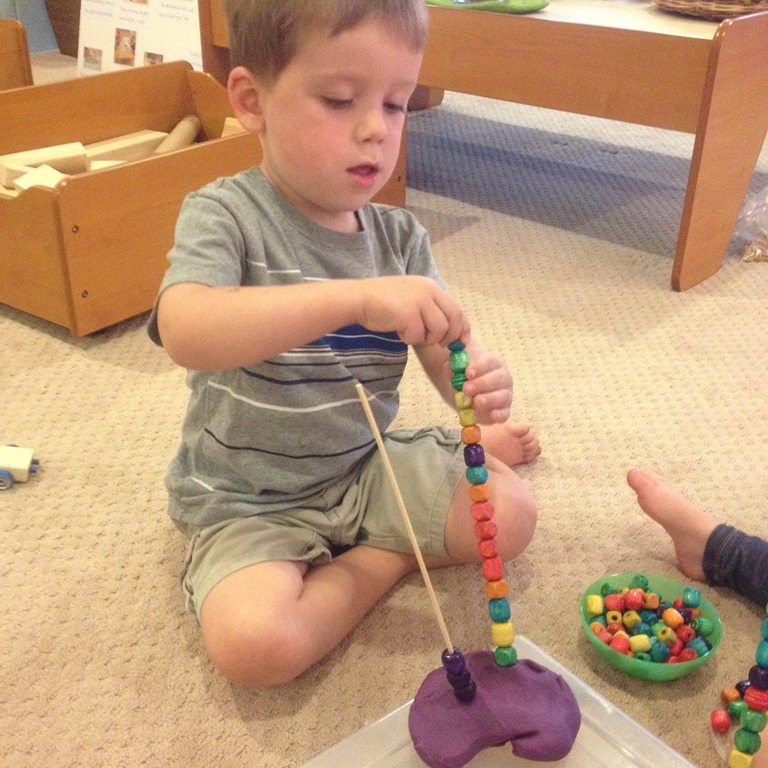 The first two weeks of school we got to dig our hands into natural play dough and wooden beads. 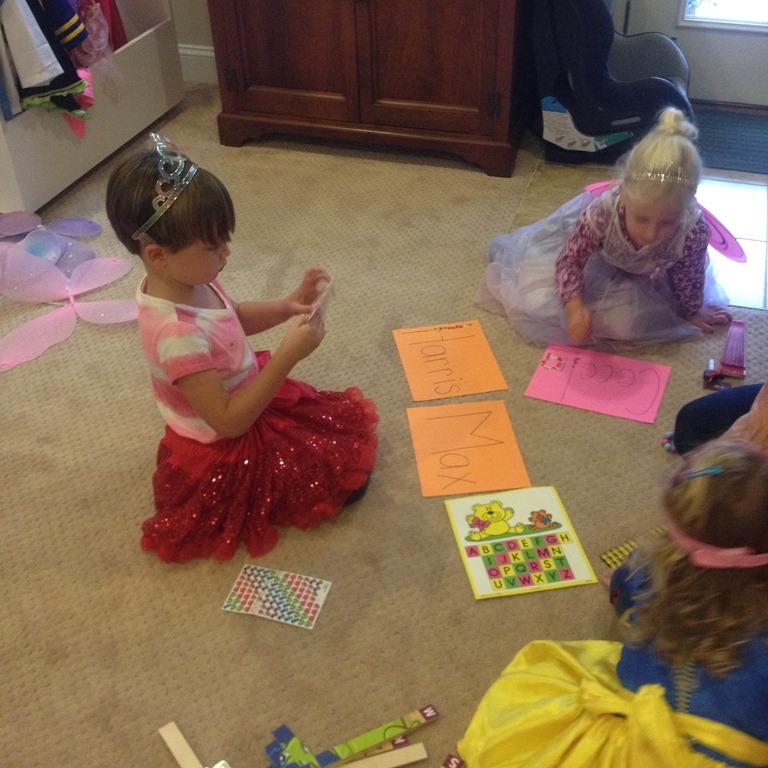 Such a simple invitation that led lots of cupcakes and pies to eat! 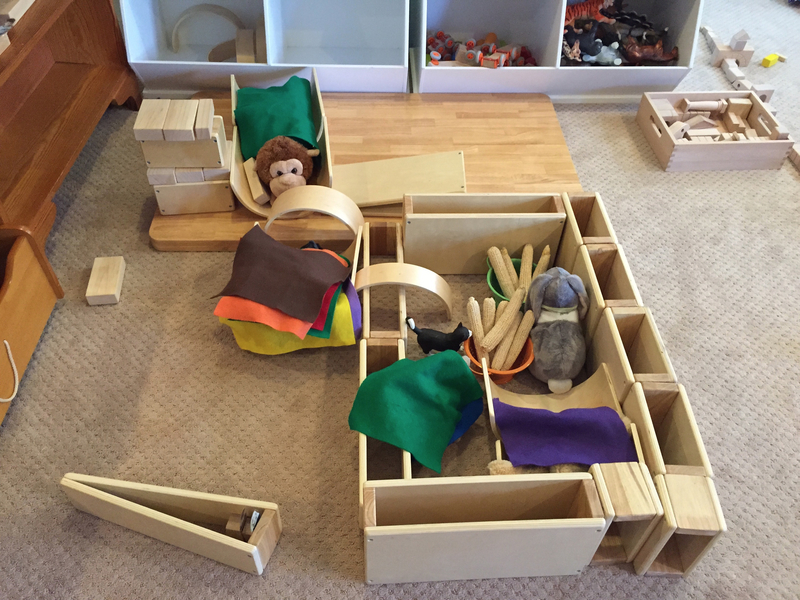 Categories: Uncategorized | Tags: block play, learning trays, light and shadow, lightandshadowproject, play based preschool, play dough | Permalink. 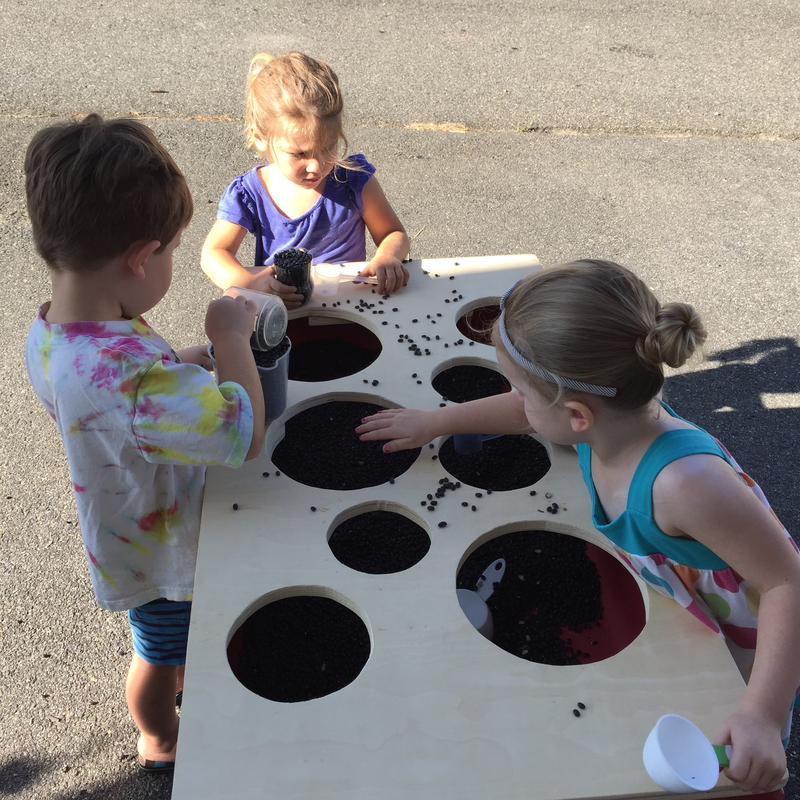 Throughout September we spent a great deal of time talking about the weather, but here and there I have been incorporating fall based play opportunities here and there. We spent a great deal of time discussing fall last year. We learned about apples, pumpkins, life cycles, and much more. 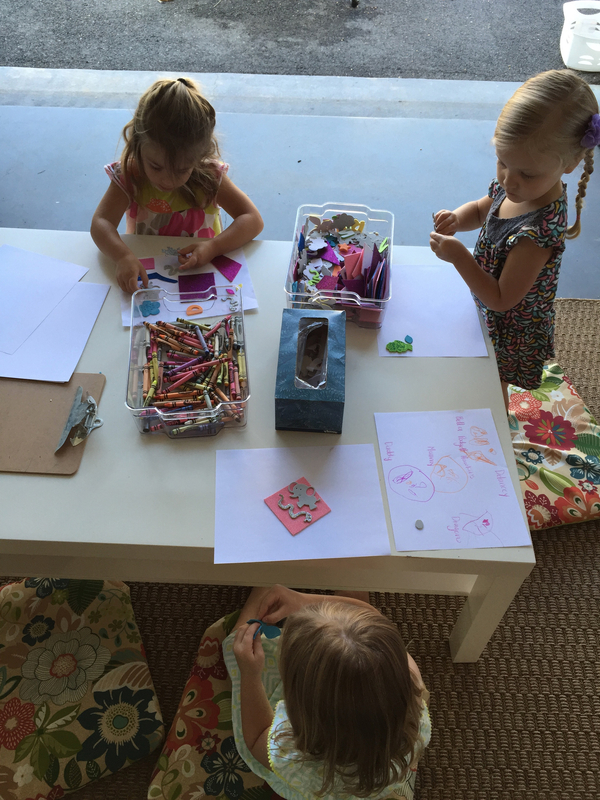 Since my group of children is the same this school year, I wanted to discuss some new topics. Of course the seasons and temperature changes were another part of our weather discussions. 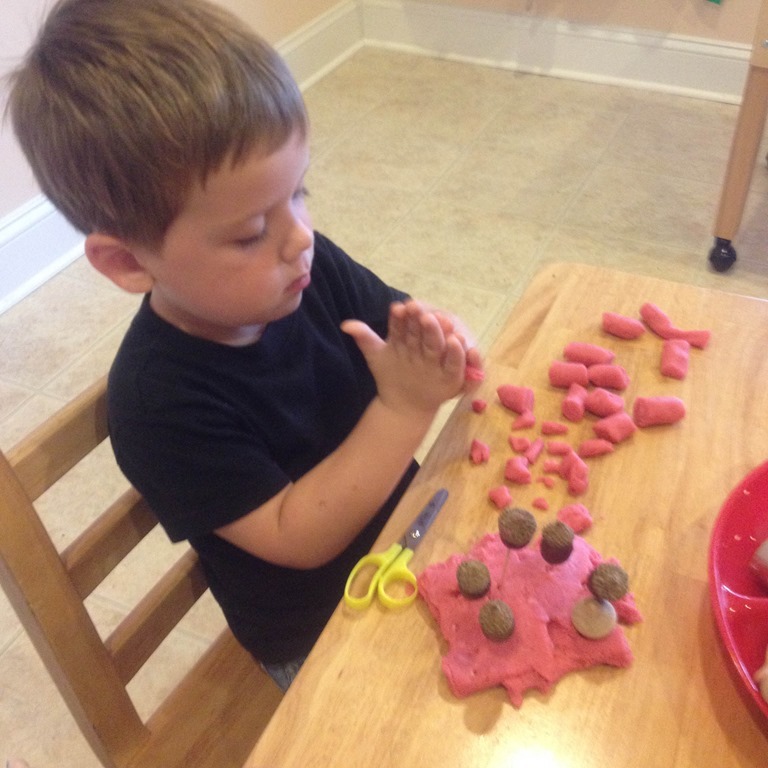 These are some pictures from my fall play dough tray that I had out for a few weeks. The tray had wooden acorns, acorns on toothpicks, leaf cookie cutters, and leaf gems. 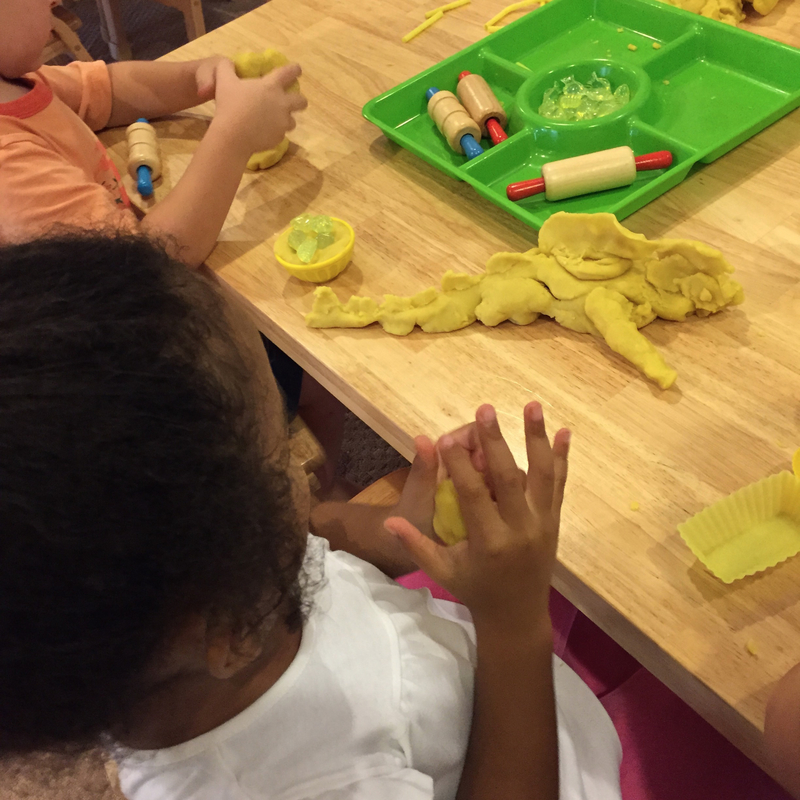 I can never, ever get enough of play dough. 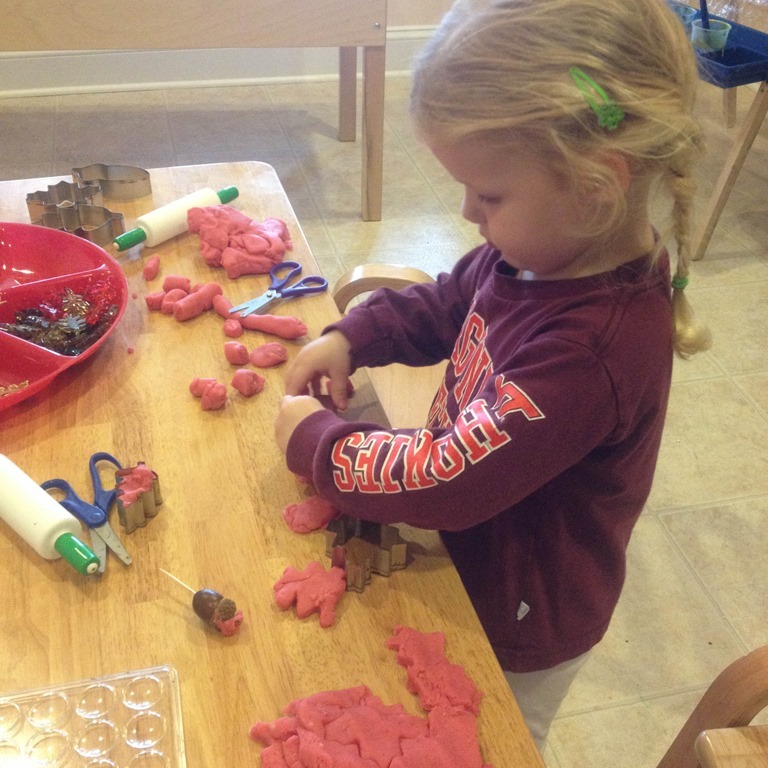 I am constantly blown away by the children’s continued interest in play dough, and the things they create. 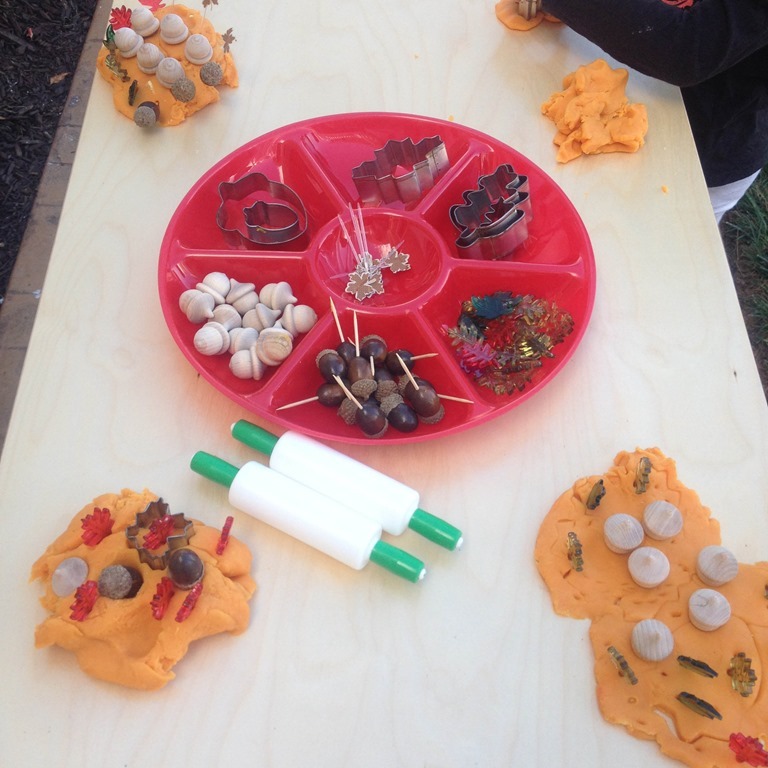 They loved pushing the wooden acorns deep into the dough, such great fine motor work! Then I moved the play dough tray inside of the classroom. I added red cinnamon scented dough to tray, and it renewed an interest in the dough again. I also added scissors, because they love rolling and cutting the dough into pieces. The oatmeal table came back out this fall. I love oatmeal and cinnamon sticks in the sensory table! The child loved scooping it and sending it down through the paper towel tubes. This year I added a bunch of handfuls of chestnuts (thank you Max’s family), and three beautiful leaf votive I found at the dollar store. 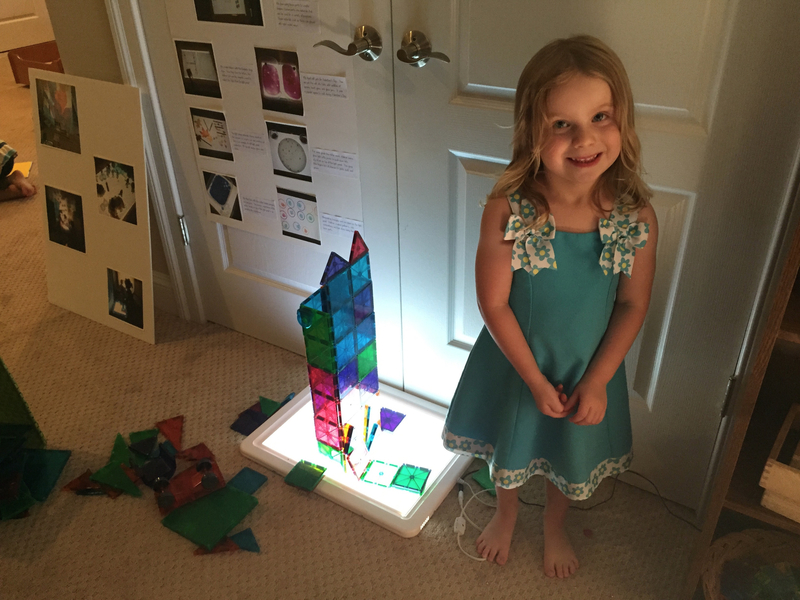 The light table has a continued interest this year. 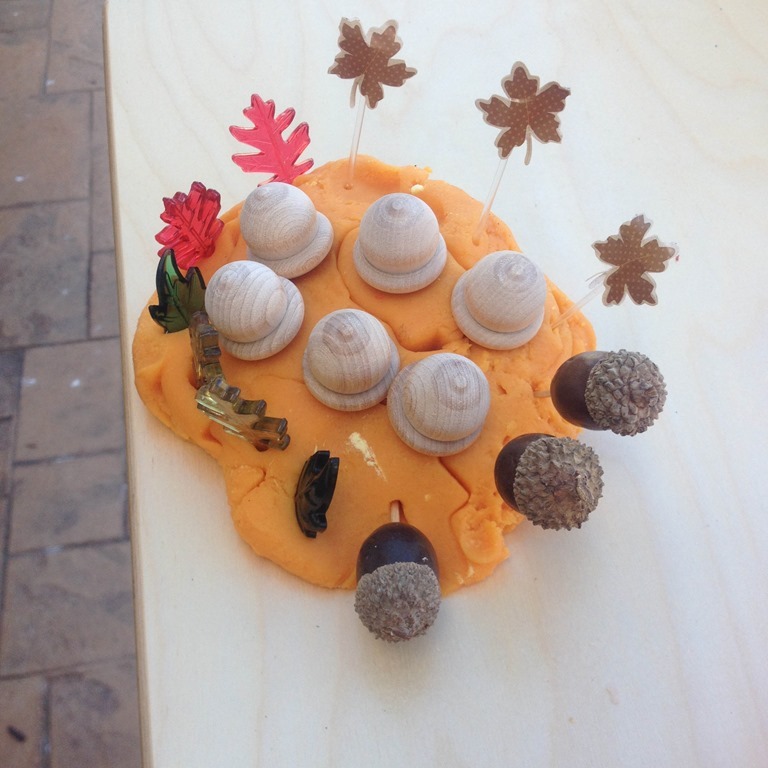 I keep trying to add new and interesting materials to engage the kids and keep them coming back for more! This year I put silk leaves, leaf gems, and popsicle sticks on the light panel. 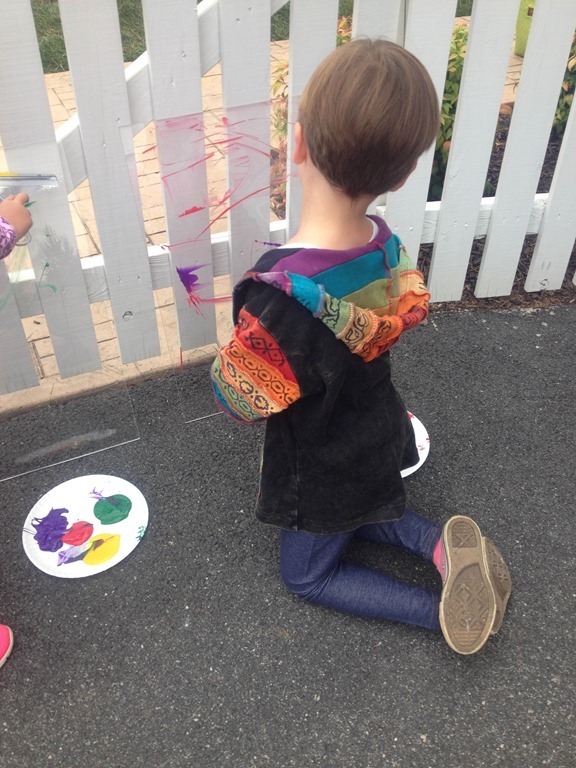 The children made patterns, and loved looking at the details on the leaves. 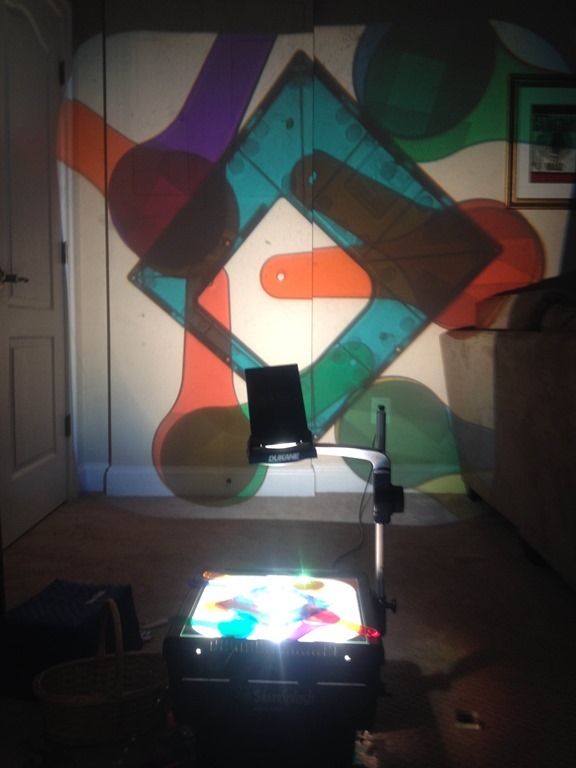 Of course there is always something interesting to create with the overhead projector! 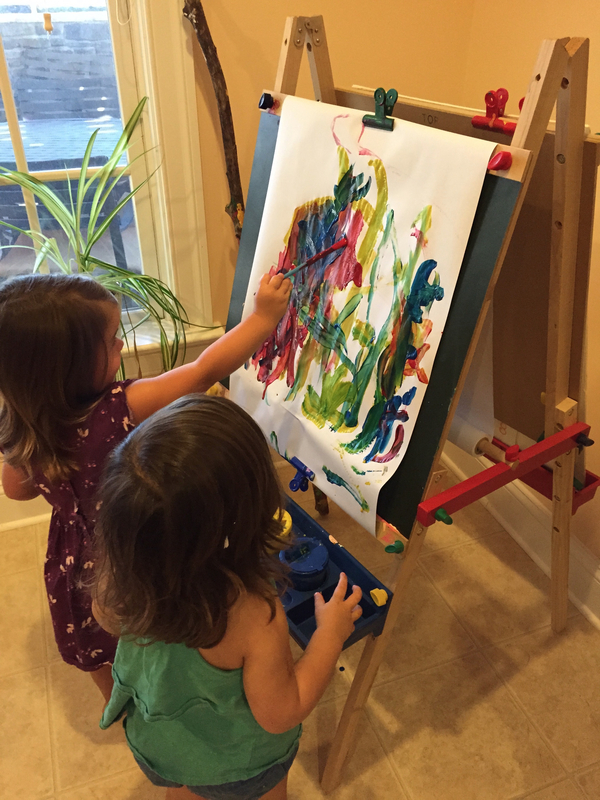 I recently purchased some plexi-glass boards from Lowe’s for a cheap outdoor easel. I set up this painting invitation with the boards, paints, and squeegees. They of course went right to town experimenting with the paints and this new form of a paint brush! This year I am trying to introduce more and more games into our learning trays. The company “Blue Orange” makes some of my most favorite games. If you are looking for a great Christmas gift that doesn’t require batteries, their games are my #1 pick! 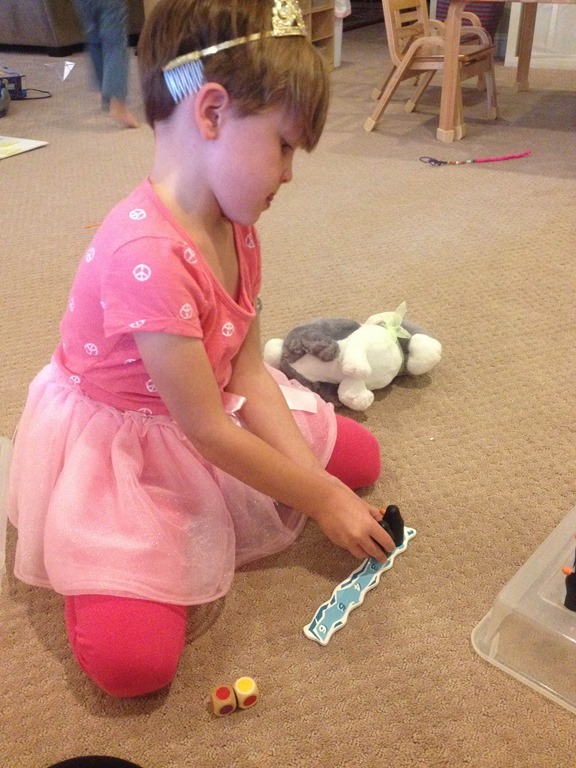 Pengoloo is a simple memory and matching game. 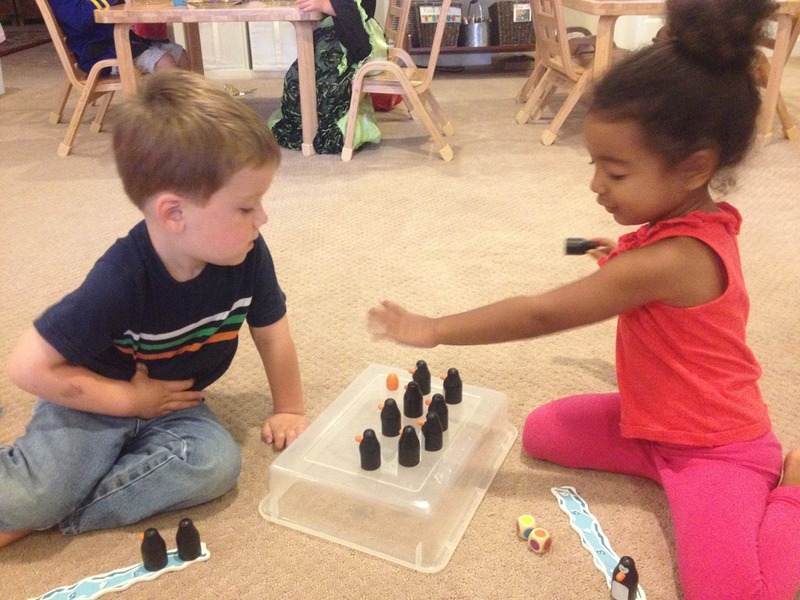 Children roll the colored dice, and try to find a penguin with the matching egg color. If they find a match they get to place the penguins on their iceberg. 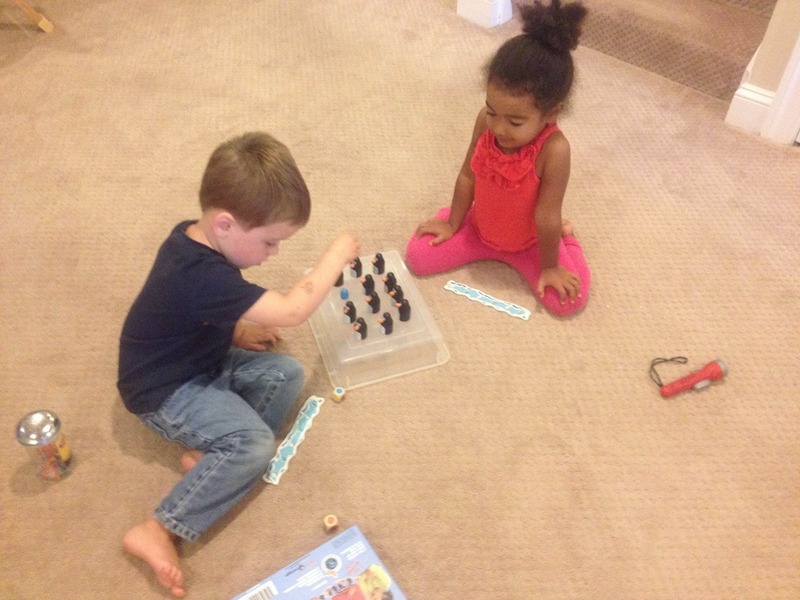 They are learning their colors, using their reasoning skills, and of course learning about turn taking. This game was a hit with everyone. Here is a simple color match you could set up at home! 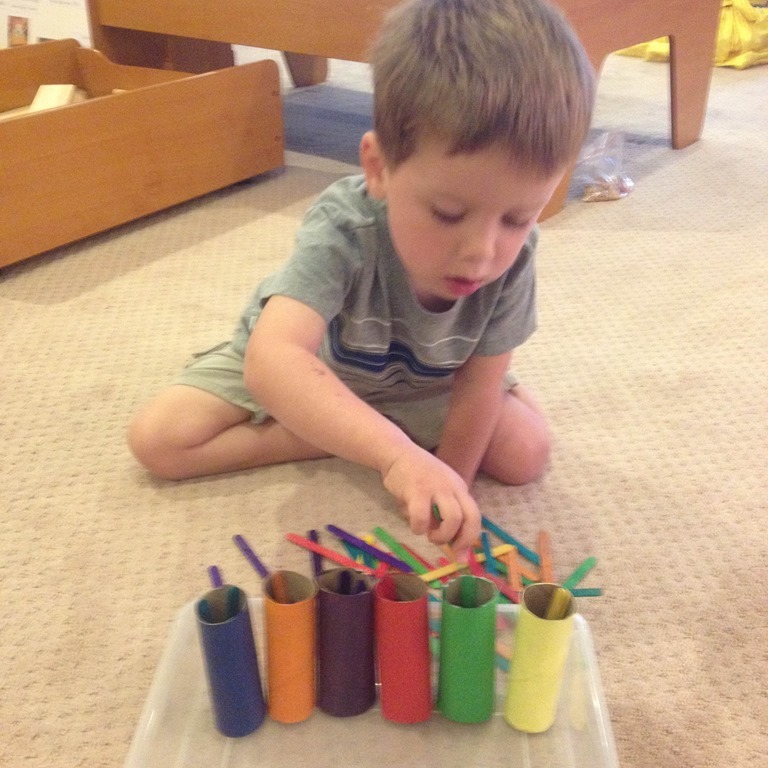 I painted toilet paper tubes different colors, and then stacked them in a line for some popsicle stick sorting. 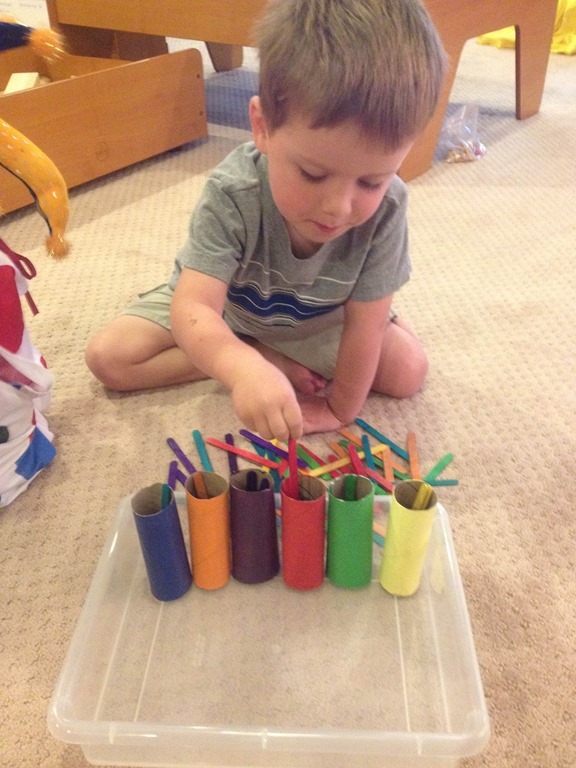 You don’t even need to paint the sticks, you can find colored sticks at the craft store! 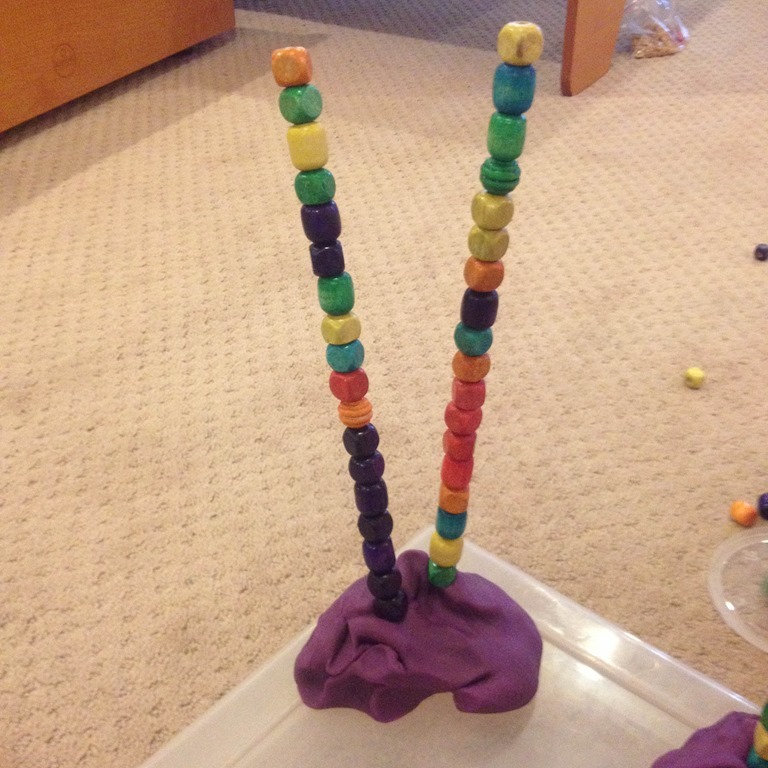 Another great and cheap fine motor activity: skewer the beads! 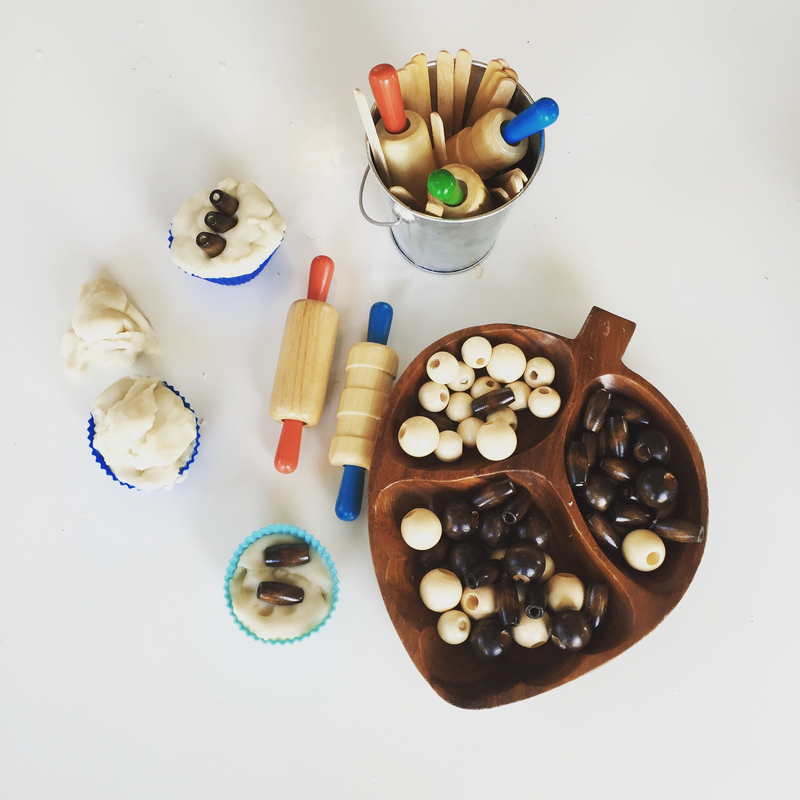 I simply stuck cooking skewers in the play dough and put a bowl of beads in the learning tray. They went right to work filling up their sticks. I pre-wrote children’s names on paper in another learning tray. They could use stickers or dot art to trace over their name. Most of my crew chose stickers of course! 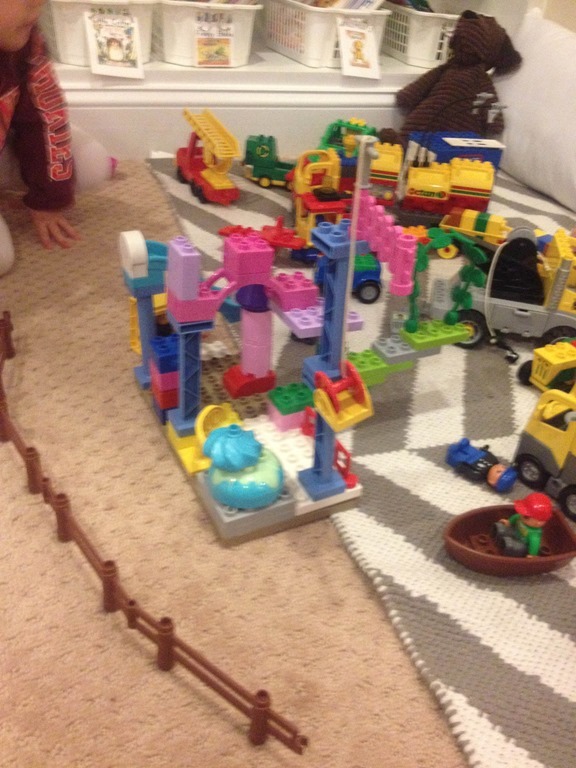 Lastly, these aren’t the greatest photos, but we had the Duplo blocks out for about three weeks. Last year the children mostly loved driving the trucks and trains around the classroom. 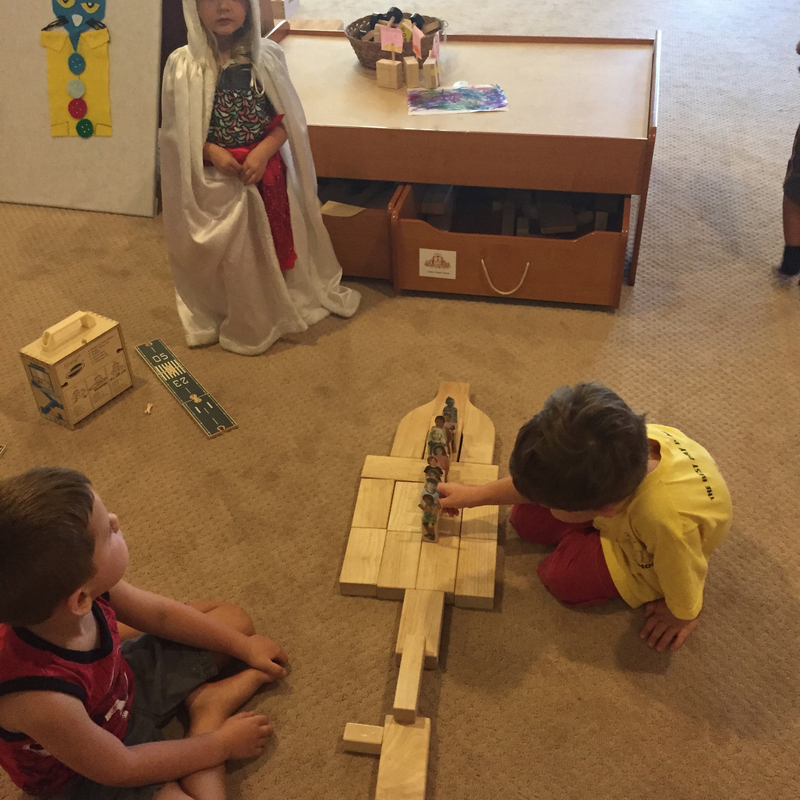 This year they worked together to make some of the most creative castles, train sets, and playgrounds. I snapped a few photos of their work, but this type of creativity went on and on for weeks. 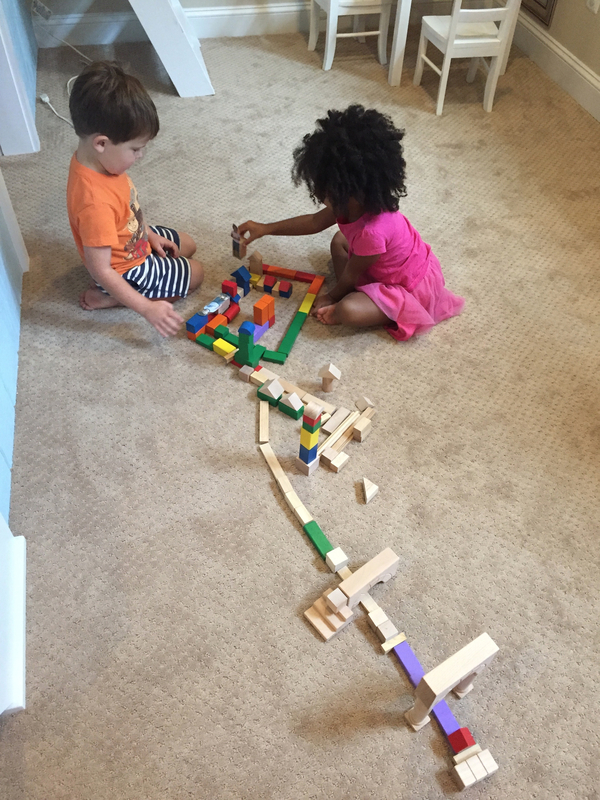 They were making elaborate Duplo trains to take around the classroom. I have truly enjoyed seeing how much they have all grown since last year, and how this has affected their play and use of materials! 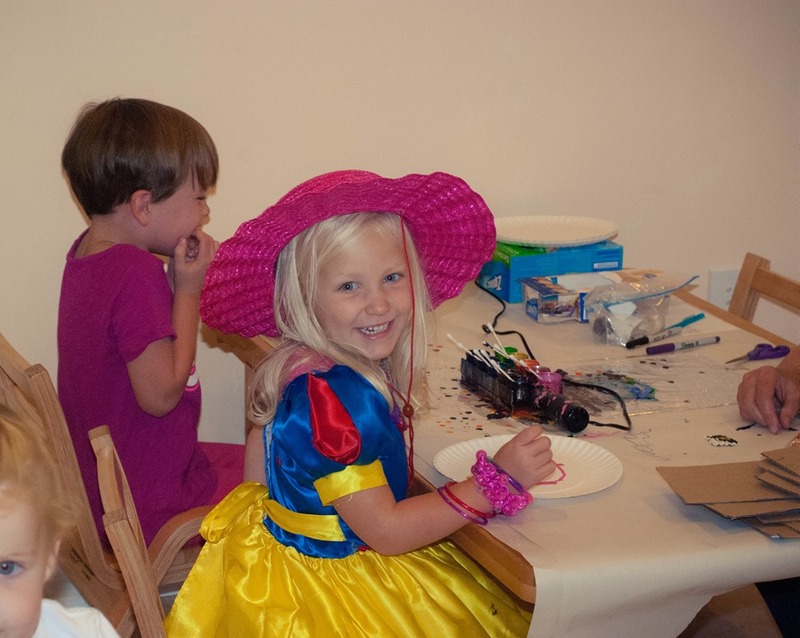 Categories: education, home based preschool, home preschool, play based learning, reggio emilia inspired, sensory play | Tags: buidling, classroom games, duplos, fall, fall sensory bins, fall themed units, fine motor, fine motor activities, games, learning trays, learnning through play, outdoor art, play based preschool, play dough, reggio inspired | Permalink. I wanted to share some pictures from our first week of school! 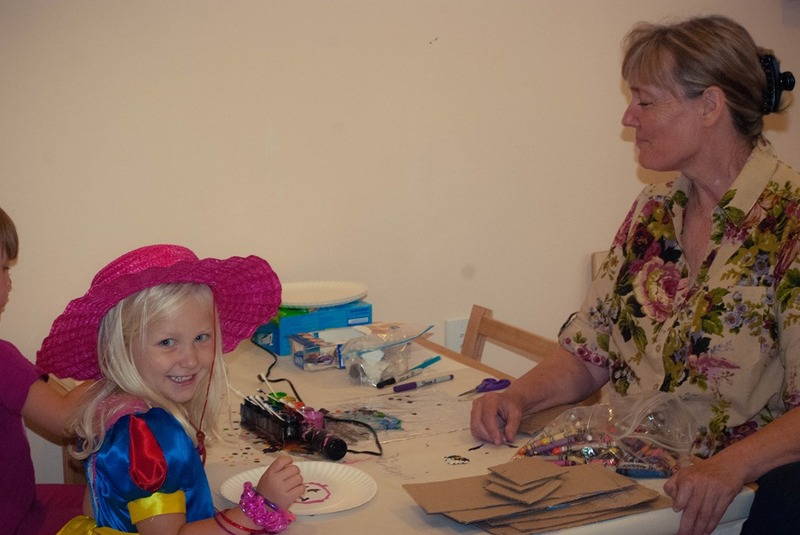 It already seems like ages ago that we met up again in our sweet school to meet new friends, visit with old friends, connect, play, get messy, dance and have fun! The first weeks are always spent working on routines, establishing classroom culture, and easing back into the classroom basics. Many of the areas of the room weren’t open the first few days of school. We opened one area at a time and talked carefully about how to play, care for, and clean up each area in our classroom. The first day of school was focused on our new and improved block area. 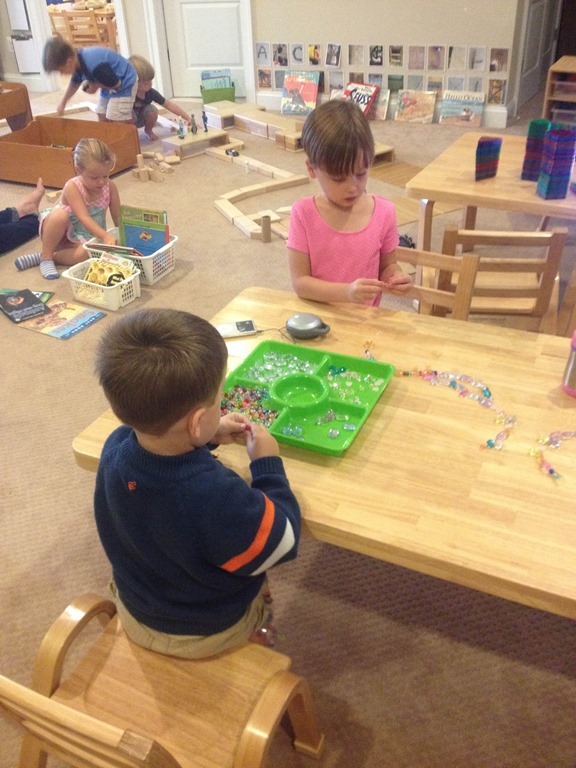 Most of the students stopped back by the invitation to add more gems to our classroom branches. 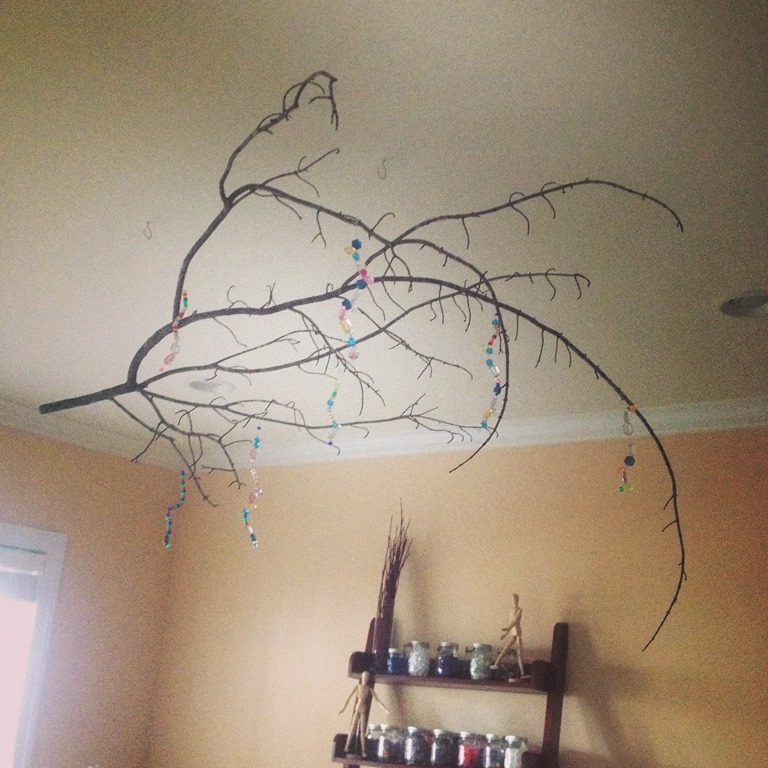 We now have a beautiful branch filled to the brim with beads! We explored with ice the first week of school! 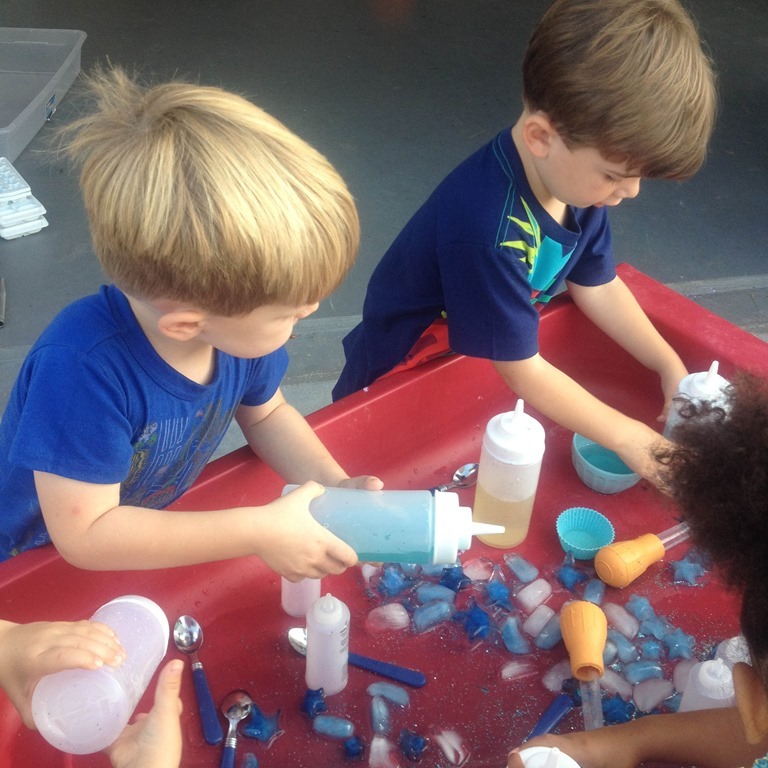 The children were given glitter star ice cubes, salt, colored water squeeze bottles, and other tools for exploring the ice cubes. 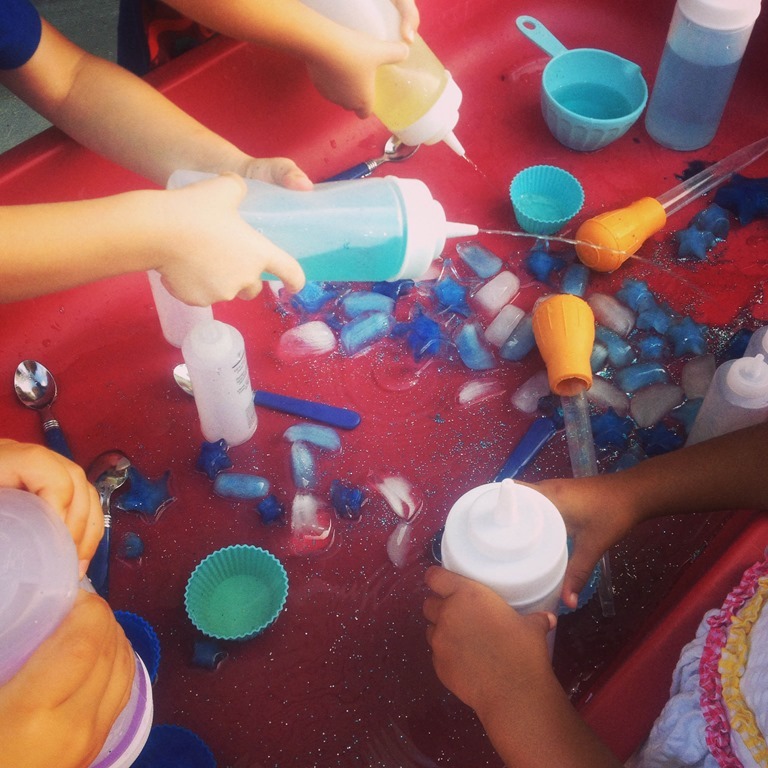 At first I thought the ice cubes were the most exciting part of this sensory tub, but pretty soon Ms. Lori and I realized that the squeeze bottles were actually the best part of this activity. 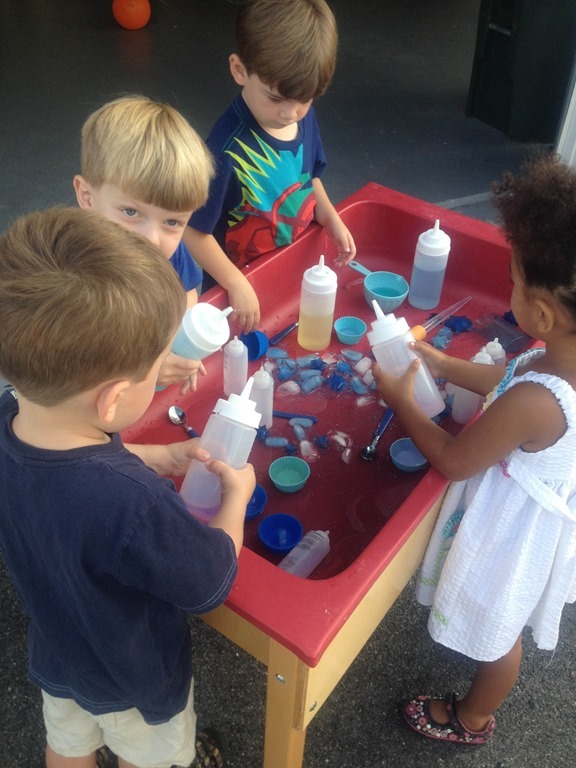 These kids loved to squeeze the water, refill the bottles, and repeat the process again and again. I started the morning with many different colors in the bottles, but by the end of the day the water was a glittery blue. They didn’t seem to mind what color was in the bottle as long as it was ready to squeeze! I love the ice, glitter, and squeeze bottles. 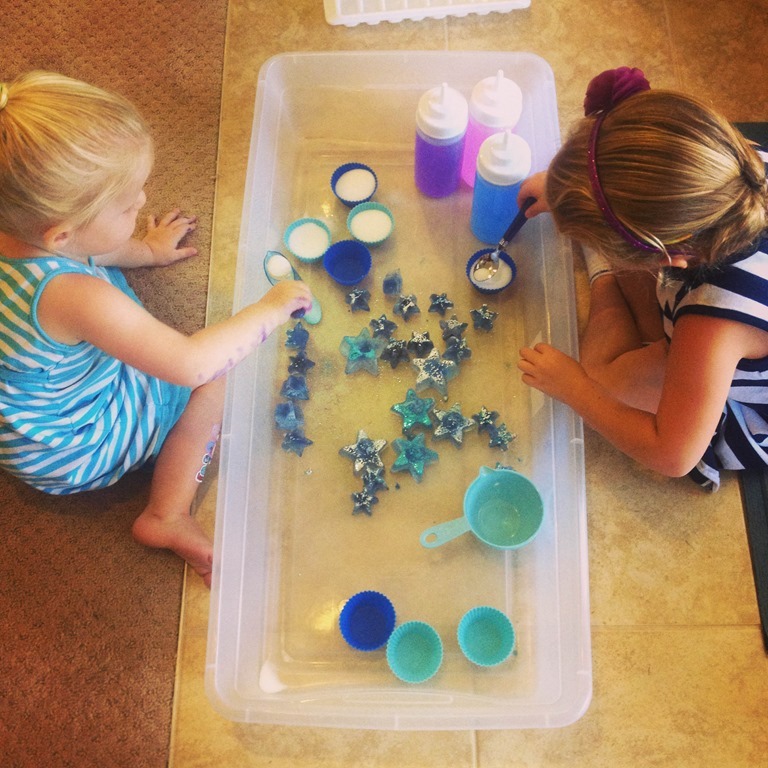 It added such a fun element to a simple water sensory tub. The large bottles I purchased from amazon, they are restaurant bottles. 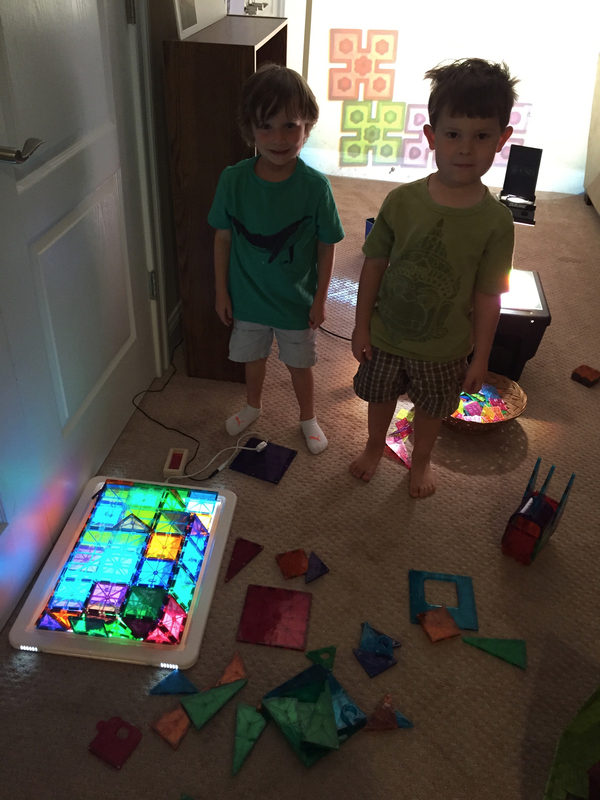 A fun addition to your play at home! 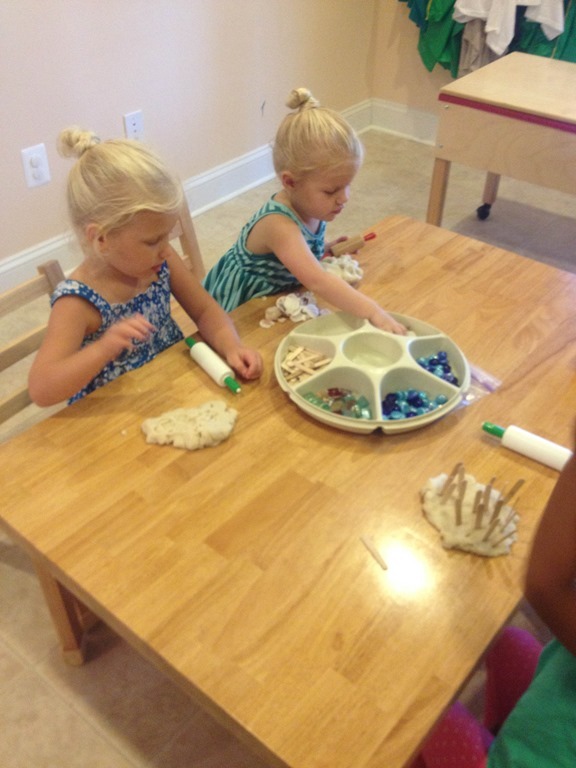 The first few weeks of school we have been playing with coconut play dough. This year I added mini popsicle sticks, mosaic pieces, mini shells, and gems. I always love to see their creations in the dough! 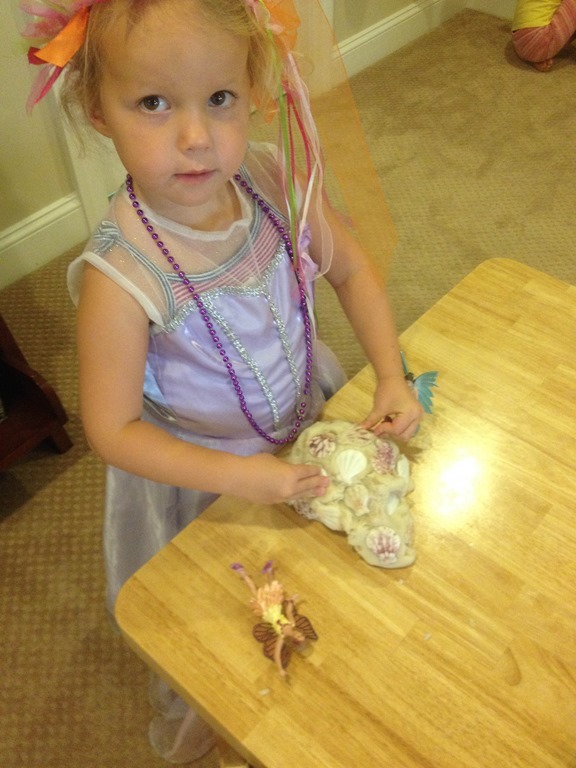 It is always important to be dressed as a fairy princess when you are working with your play dough! The first week of school Ms. Lori brought this amazing crayon melting machine to our art room for the children to explore. 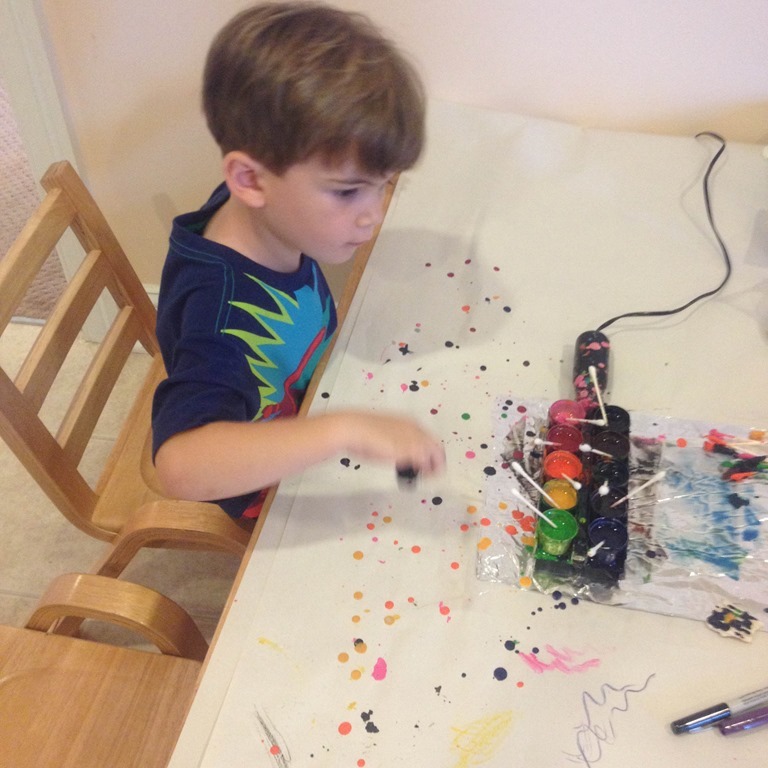 It heats up on a low temperature and melts the crayon pieces. 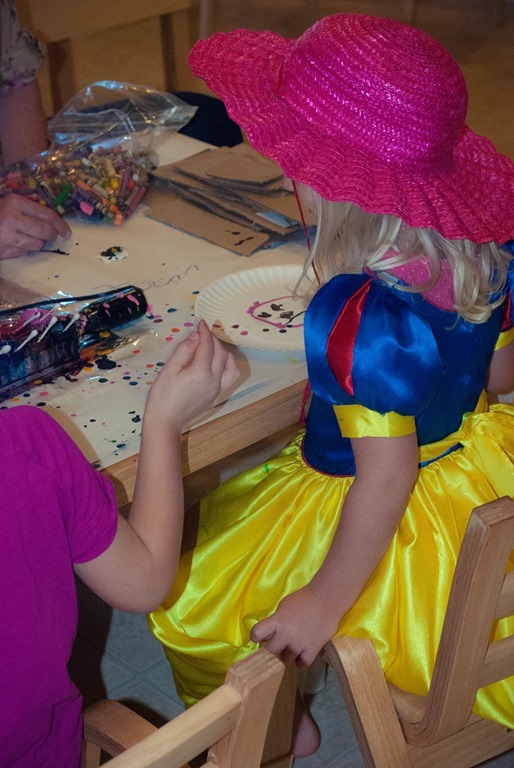 The children “painted” with melted crayon on sea shells and onto paper plates. Look at that smile! I swear M is giggling in the background! A few pictures of the children interacting with our wonderful Ms. Lori the first few days of school! 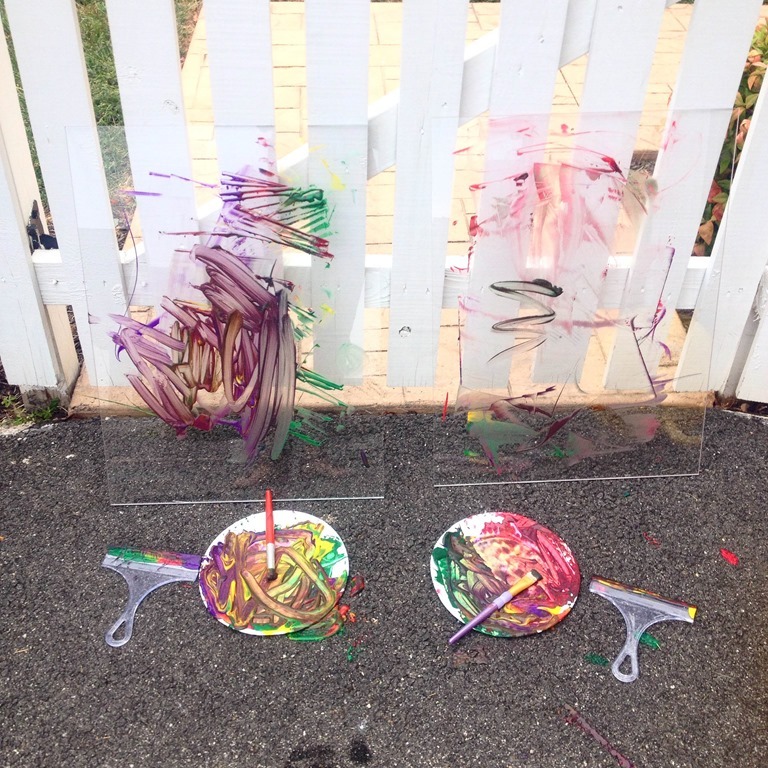 One of the mornings we did a combination of process art and sensory play! 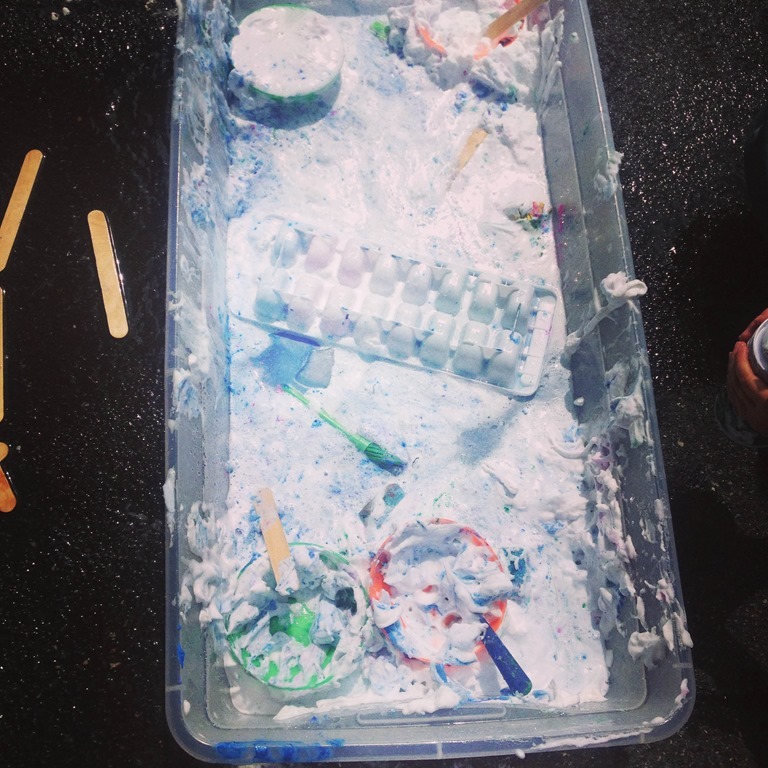 I filled a tub with shaving cream, added ice cubes of paint, bowls, scoops, and popsicle sticks and paint brushes. 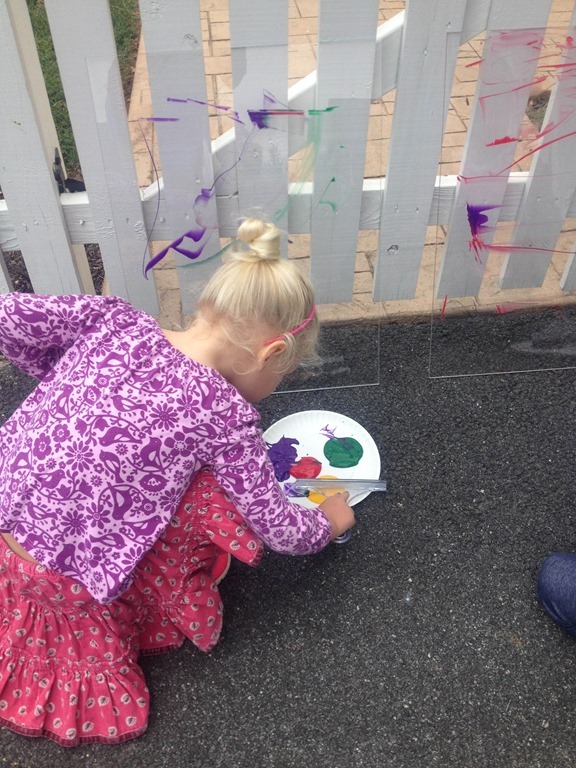 The children loved mixing the melting paint into the shaving cream! I will take a picture of our new Classroom Jobs sign that the children wrote! D and M enjoying our light area together! 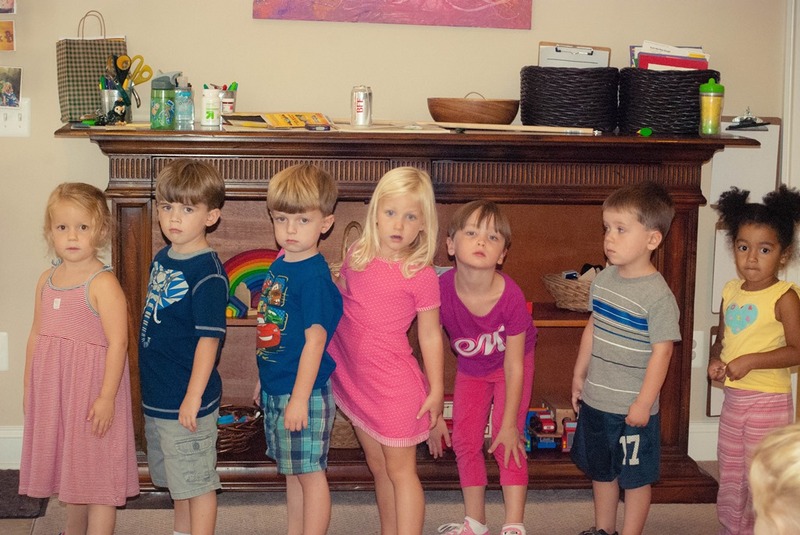 Just had to end of this hilarious picture of “practicing lining up.” This was the closest I got to all of them looking at me! 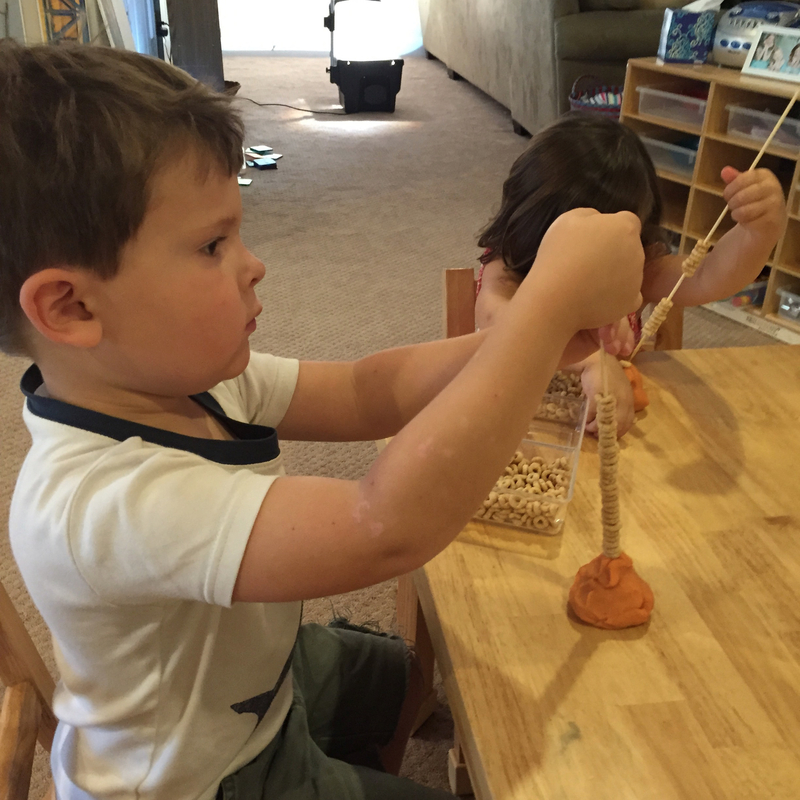 Categories: home based learning, home based preschool, play based learning, preschool, process art, reggio emilia inspired | Tags: beads, block play, crayon art, messy play. 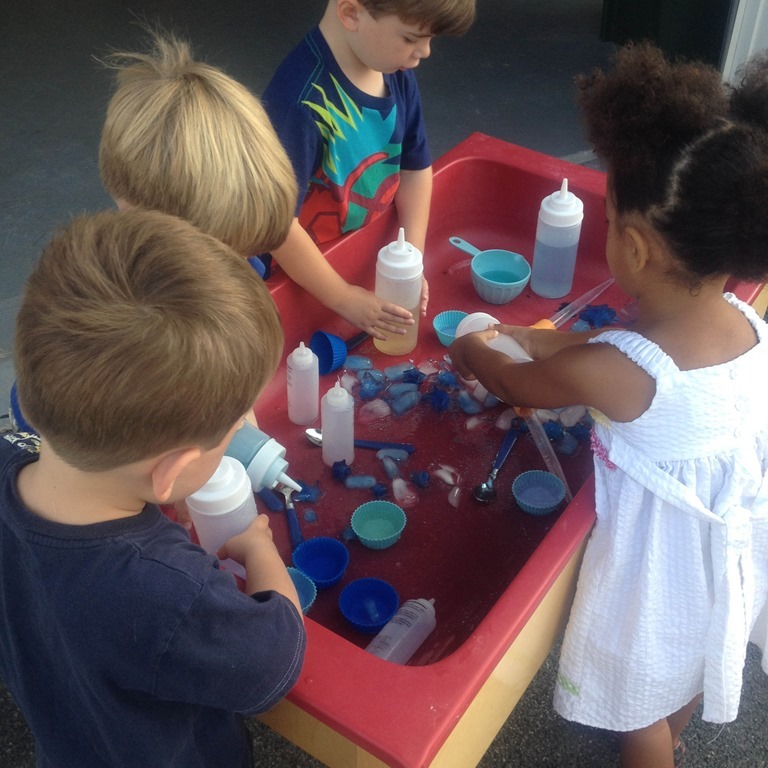 water play, nature, nature art, play based learning, play dough, process art, reggio emilia, reggio inspired, responsive classroom, sensory play, sensory tables, shaving cream play | Permalink.